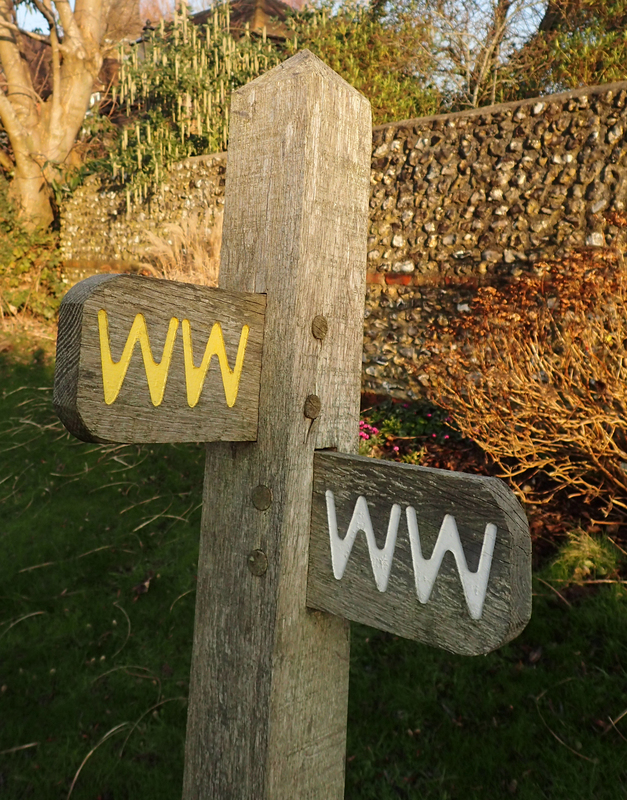 The South Downs Way is a 100 mile National Trail between Winchester and Eastbourne. it follows the northern escarpment within the South Downs National Park for most of its distance and is a fairly gentle walk along the chalk downs with only occasional drops to cross river valleys. Three Points of the Compass completed a five month 2000 mile hike in 2018, much of that time was taken as unpaid leave so consequently still had a few days holiday left to fit in before the end of the year. So I decided to knock off another of the National Trails. I walked this trail decades ago when I was in the British Army, but the memory has dimmed. 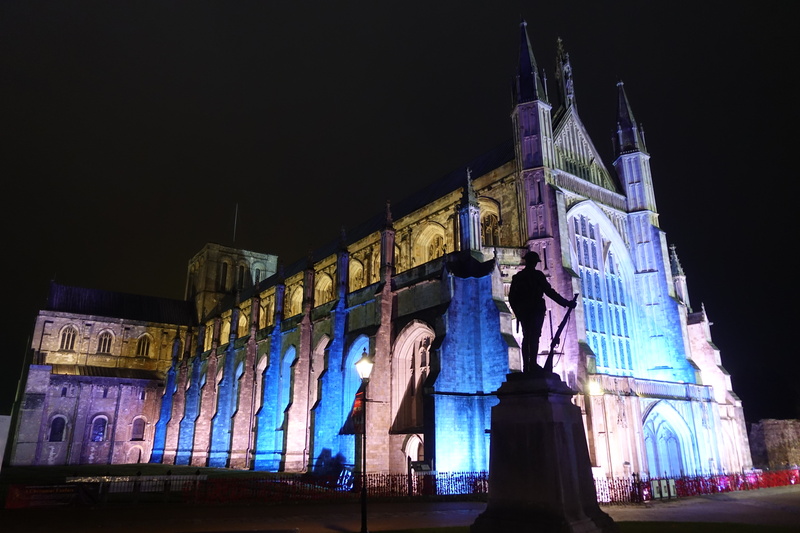 Not only that, but it used to be considerably shorter, originally extending only as far as Buriton until the circa 25 mile extension to Winchester was approved in 1989. I decided to complete the Way as a winter thru-hike, doing a mix of camping and accommodation. 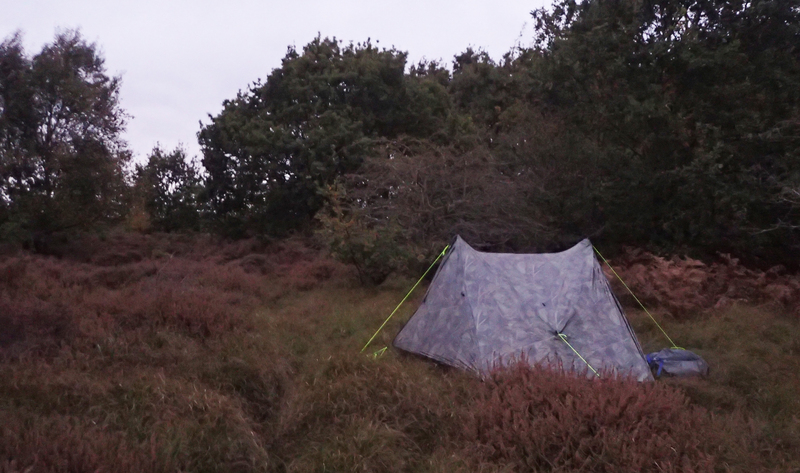 My Z-Packs Duplex had been worn out completely on my Three Points hike earlier in the year so I took my Nigor Wikiup 3 pyramid tent instead. In a nod to the colder conditions expected, instead of simply using a bivi-bag inside the shelter as I have in the past, I took a small one person nest to make the nights a little more comfortable. 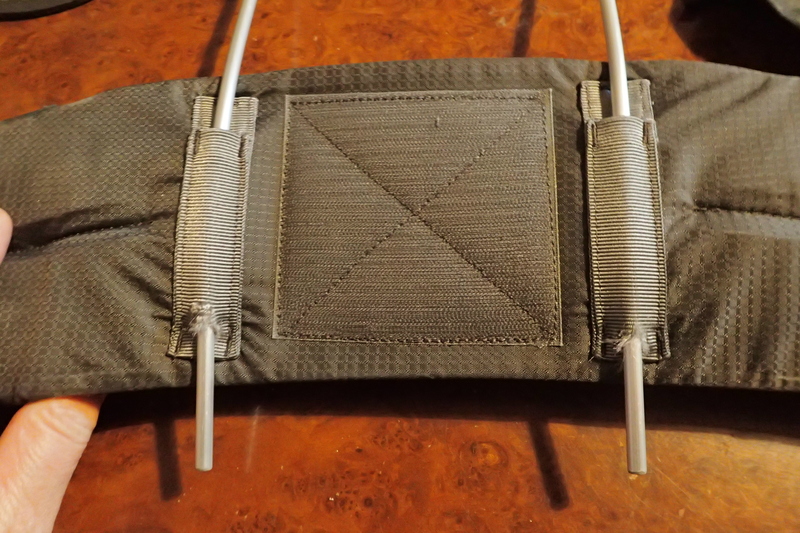 This was the Hex Peak single inner V4A. 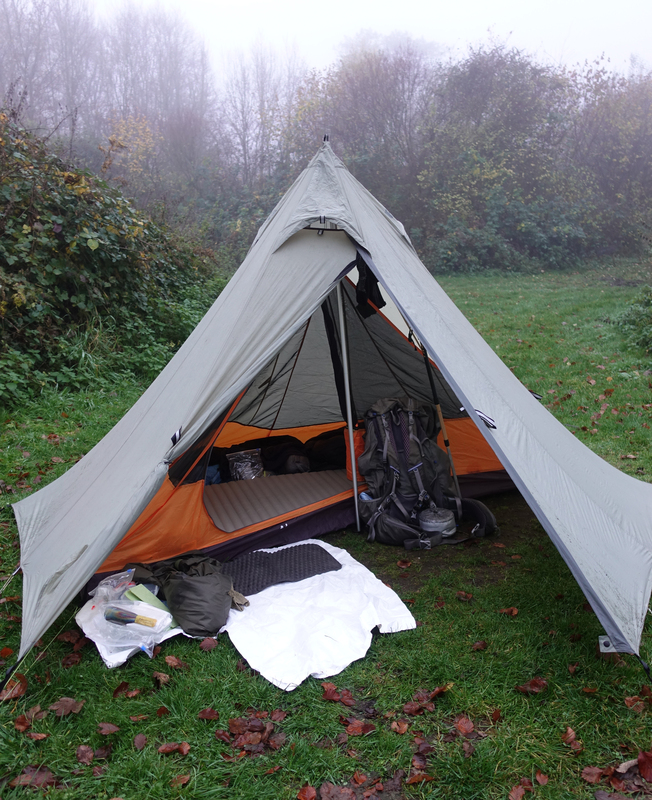 It worked brilliantly and the three nights slept inside were all very comfortable despite winter arriving with a vengeance while I was on trail. My complete gear list can be found here. Accepting that the weather had turned, I carried a few more comfort items of clothing in addition to those I usually take on longer hikes- a mid-layer, puffy trousers and jacket, down beenie etc. Base weight was 9615g but because it was a pretty short hike I carried much of the food I would require. This meant less reliance on infrequent shops, less time spent hunting down meals when the daylight hours were short and less miles added to my total. 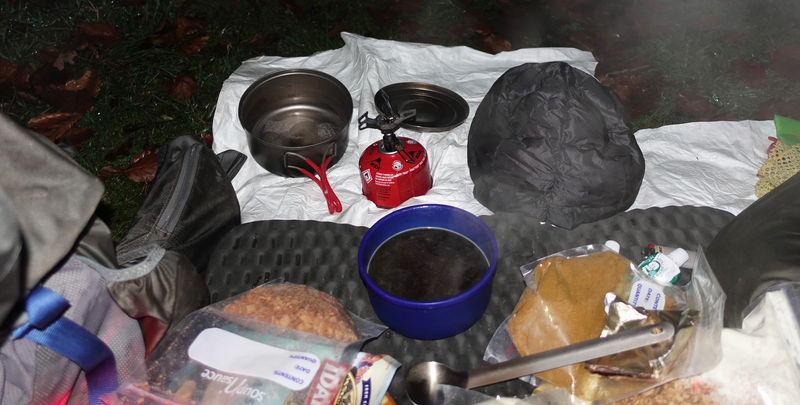 Cooking was simple- lentil curries, hot drinks such as tea and OXO, granola for breakfast, plenty of chocolate. Tortillas and tuna pouches for three lunches. A few flapjacks were also stuffed in. For this trip I carried the little 25g BRS 3000-T ‘bumblebee’ stove and a 110g gas cartridge. Having enjoyed a pint in one of Winchester’s older establishments, I followed this with a meal in the local Wetherspoons. A big mistake, going for cheap and plentiful calories I waited over an hour for my food which was dire and even the selection of beers was poor. 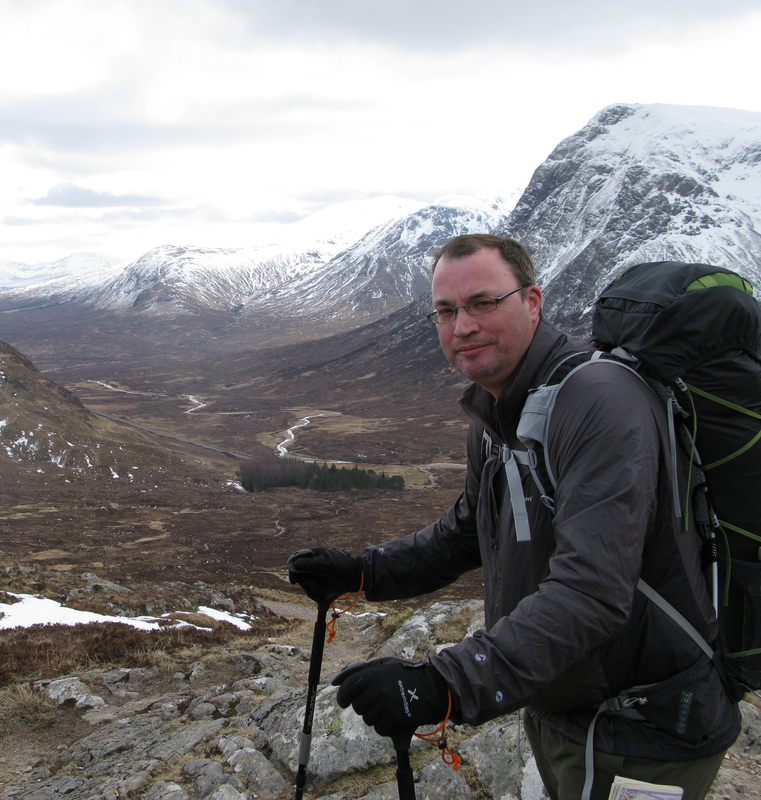 A shame as I can normally rely on a ‘Spoons to deliver what a hiker needs. 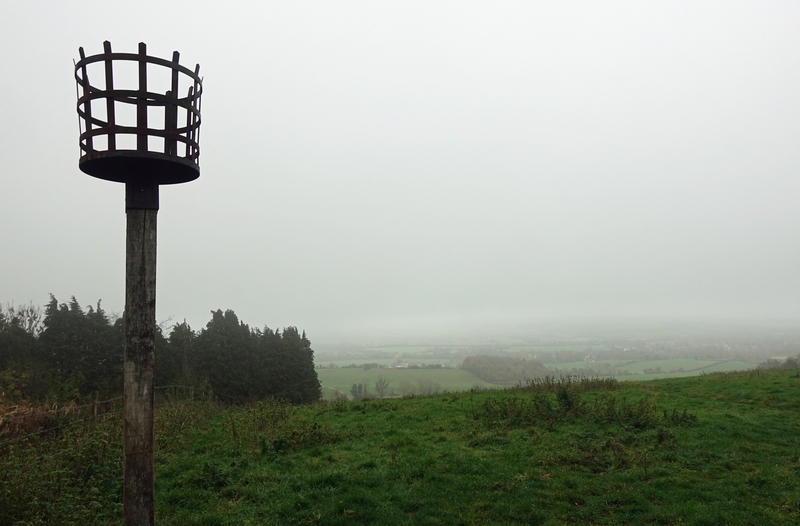 With sixteen miles completed by 11.40, my first halt was a little later for lunch at the Bronze/Iron Age site on Old Winchester Hill, just one of many National Nature Reserves I passed through. I knew that with short day light hours I was going to have to get a move on to that night’s halt. But I still took a break for a mug of tea at the fly fishers little cafe adjoining the tackle shop at Meon Springs. Friday’s camp site was at the Sustainability Centre, Wetherdown Lodge. Arriving at 14.40 after slightly more than twenty miles, I had a winter pitch booked which still meant I had a warmish shower and compost loos to use. There were no other campers and after pitching the tent, I managed to get to the cafe on site minutes before they closed for a pint and a bag of crisps. Back to the darkened tent for lentil curry and instant mash. With a long night before me, I settled down in a warm quilt at 18.50. I slept well, the campsite was silent beyond a few owls, a mouse rustled through my rubbish bag outside but cleared off when I muttered at it. I rose at five as I had a twenty four plus mile day to complete to where I hoped to wild camp that night. 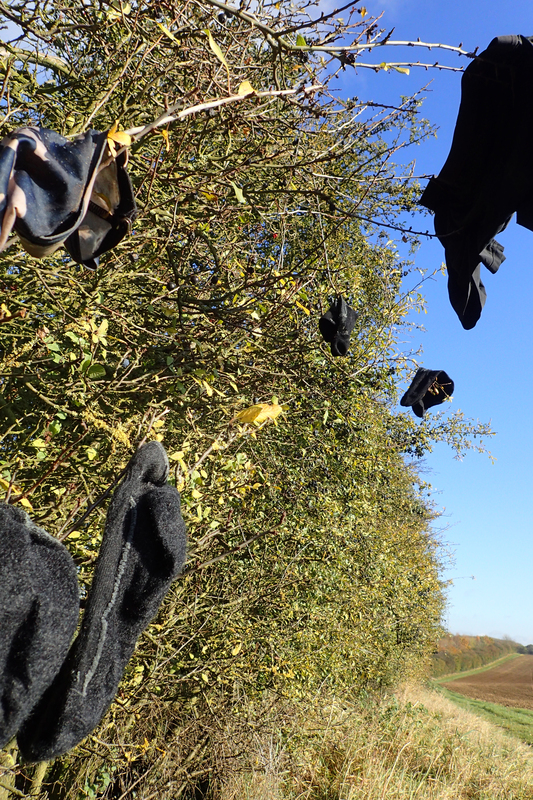 The temperature had dropped considerably and I was pleased I had bought a full set of insulated clothing as camp wear. Quite a bit of condensation on the inner surface of the shelter, nothing within the nest however. I wiped this down while the tawny owls set off again, breakfast, ablutions, packed and away prior to seven. A bit later than I had hoped but I frequently faff around a bit too much on my first morning. It wasn’t long before I was into the Queen Elizabeth Country Park. it was good walking through the wooded park until the wonderful long and sweeping descent down to the crossing of the A3. 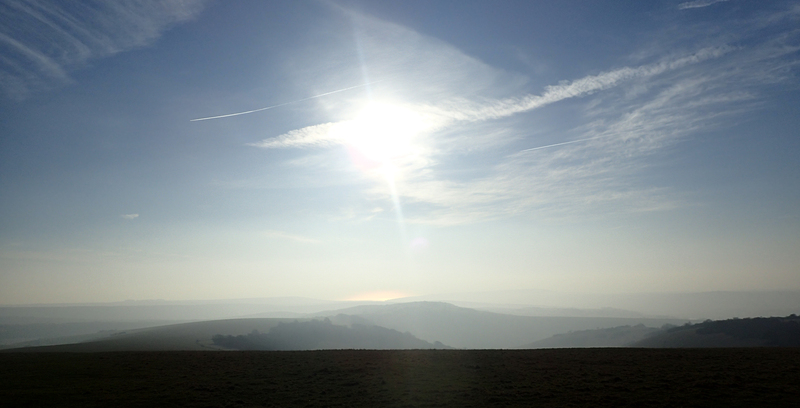 I held a gate open at the bottom for a couple of horse riders who after thanking me, set off at a fine gallop up the slope toward the ancient field systems below Butser Hill that were very evident that morning with the misty low sun and long shadows. I had held faint hope of a bacon sarnie at the cafe in the visitor centre beside the carpark but that didn’t open until ten. I wasn’t waiting around for two hours so after a brief chat with a marshal setting up for a Park Run taking place later (it was a Saturday), I walked on through the park and out the other side. It sounded as though World War 3 had kicked off as there were shoots taking place in all directions. The path was pretty stony today and the feet felt it a bit in my mostly worn out Altra Lone Peaks. Time for a new pair perhaps. The mist cleared a little in the afternoon but soon gathered again as the early evening approached, so views were modest. My planned halt that night was at Glatting Beacon but I found that there was a cold wind whistling up the slopes so hunted around for a bit looking for shelter. I eventually settled for a quiet little flat space immediately next to the entrance to the compound containing the masts. It looked as though the place had few visitors, as evidenced by what appears to be arson attempts to the buildings within the compound. Another lentil curry and plenty of chocolate. I had a good signal there so was able to chat to Mrs Three Points of the Compass for a while as I sank hot drinks, first an Oxo, then tea, finally a hot chocolate, then early to bed as I could feel the temperature dropping. I didn’t sleep fantastically that night. I was warm enough but the cold was evident in the morning with a heavy frost. My alarm failed to sound at five thirty, possibly affected by the cold, but I woke soon after anyway. Hot mug of tea and granola followed by ablutions. I had picked a pitch away from the cold wind but condensation was heavy, this immediately froze as soon as I opened the tent flap in the morning. Being frozen, it was easy to shake this off when packing up. It was a lovely clear morning when I hit the trail a little after seven. It was Sunday and this was the busiest I saw the trail with quite a number of dog walkers out. There were quite a few deer in the fields, running as soon as they saw me, stopping to gaze at me from a safe distance, then turning and running again. Partridges cher cher cherred away in low loping flights. Yesterdays Buzzards were now joined by numerous Red Kites. It was a good days walking with the best views so far on trail. Sunday was a nineteen and a half mile day to Truleigh Youth Hostel. 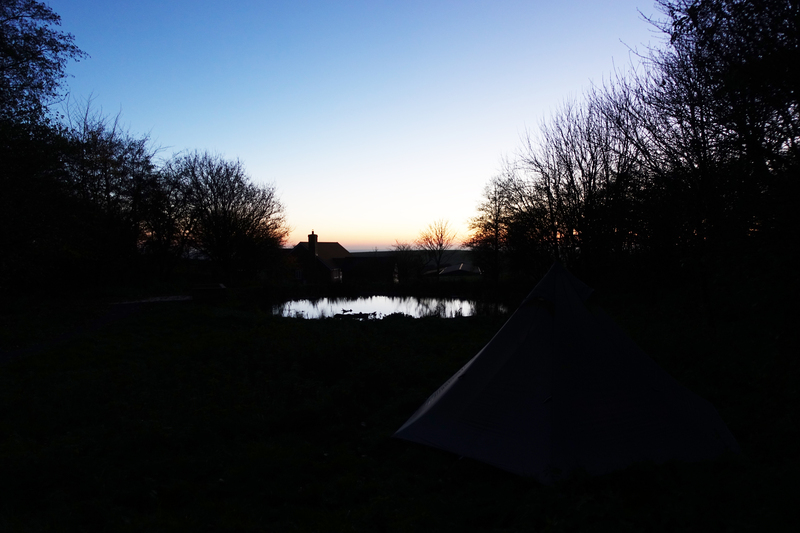 I hadn’t been able to book it as it was on exclusive hire but emailing them, the warden had kindly informed me I was welcome to camp in their field opposite- “hide in the field, by the pond or under the trees”, she had also left the campers w/c and shower unlocked for me. I made sure to leave a generous donation in the charity jar when I left the following morning. When I arrived at the hostel, quite a few of the group that hired the hostel were outside the entrance smoking. What they were smoking I had my suspicions. Drinking and dancing was taking place on the first floor. In chalk smeared outdoor clothes, I felt alien to what was going on but stood chatting to the small group on the steps. I was asked where I had camped the previous night, I told them it had been a wild camp- “wow, that’s awesome”, I quietly demurred- “it was just the one night, not much of a pitch, no view to speak of…”, he interrupted ” yeah, but wild anything, that’s cool”. A couple of them were unloading a large sound system from one of the vans- “its a fiftieth birthday party, it’ll be going on ’til the morning”. Oh great! I held out little hope of any sleep but as it was, barely heard anything tucked away some 100 metres away. I slept pretty well that night and condensation was limited in the morning. The weather was cold with clear skies and good views for much of Monday mornings walking. There were a couple of highlights to visit today. Having crossed the Hulking escarpment, it wasn’t long before I was passing through scrubby downland above Devils Dyke; Britain’s largest single coombe of chalk karst, this is a steep dry valley. Through Saddlescombe, the Hikers Rest cafe closed at this time of the year, then a leisurely halt at the Shepherds’ Church at Pyecombe. 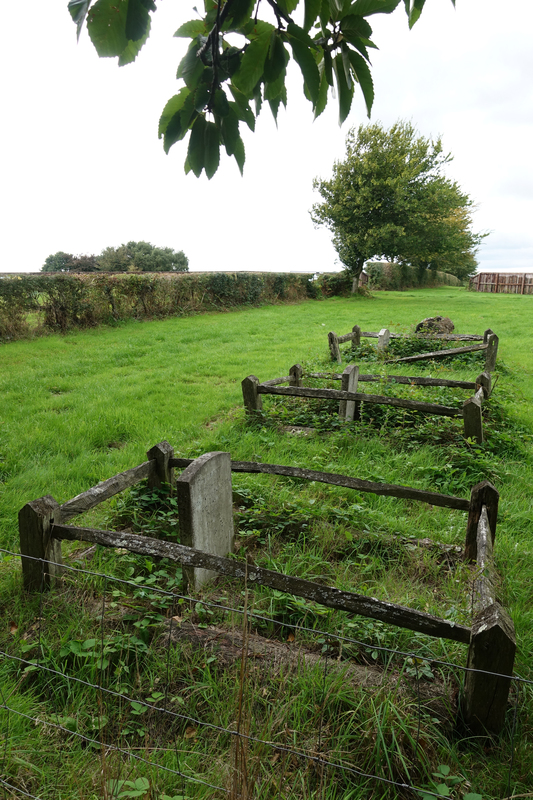 The village itself was hit badly by the plague in 1603 and is now split with part of the village now situated half a mile away from the remainder. 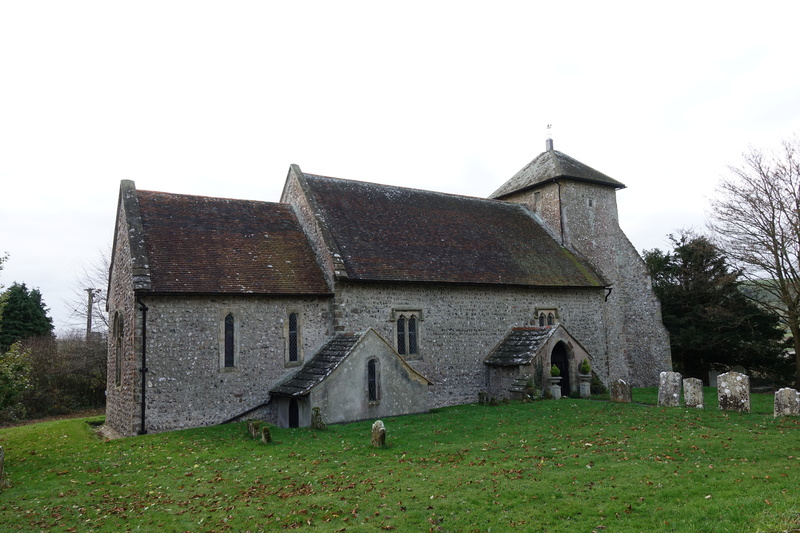 Famed for the Pyecombe Hook, a particular design of shepherds’ crook, I was only slightly more fixated on the dedicated room newly built on to the rear of the church specifically for pilgrims. 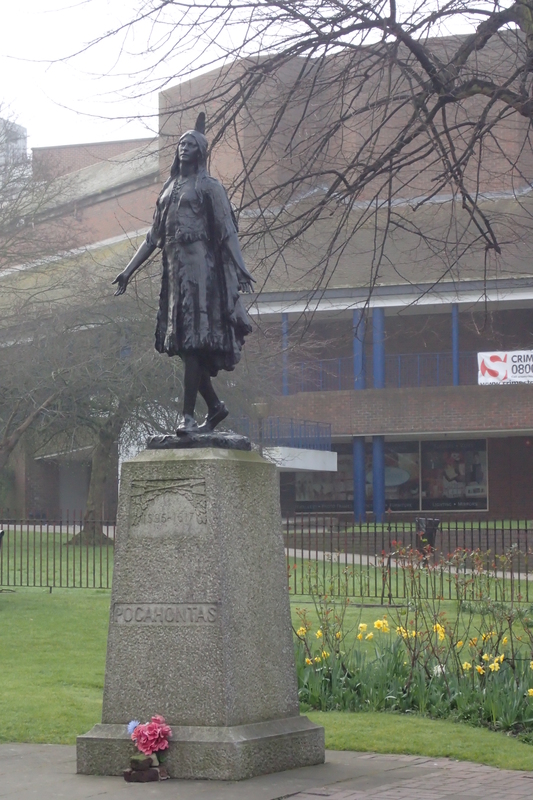 I declared myself a pilgrim and stopped in to use the facilities and make a cup of tea followed by a hot chocolate. Eating flapjacks and bars and chatting to a parishioner meant this was a prolonged halt. Then on to the equally famous Clayton windmills, better known as the Jack and Jill windmills. I diverted slightly off trail to go and see these. Jack, a dirty black smock mill is a pretty poor sight now. It has no sails and is a private residence. 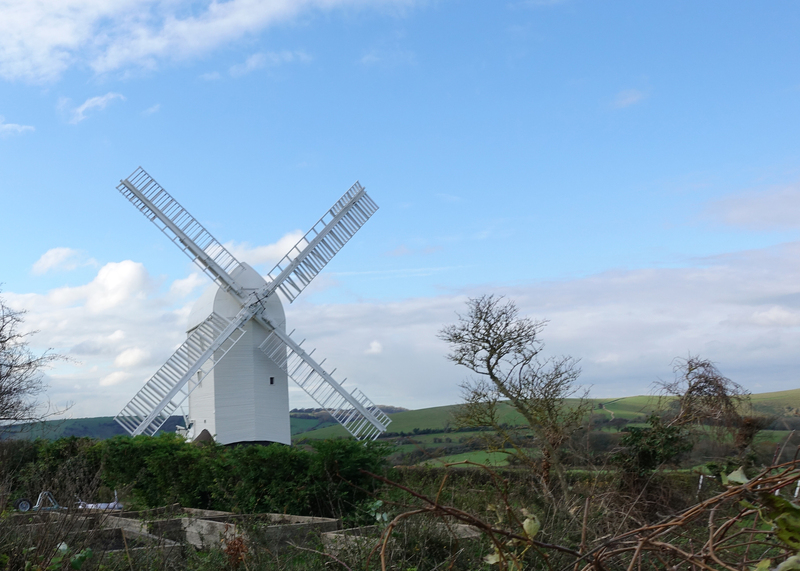 The nearby Jill, a white painted post mill looks superb. 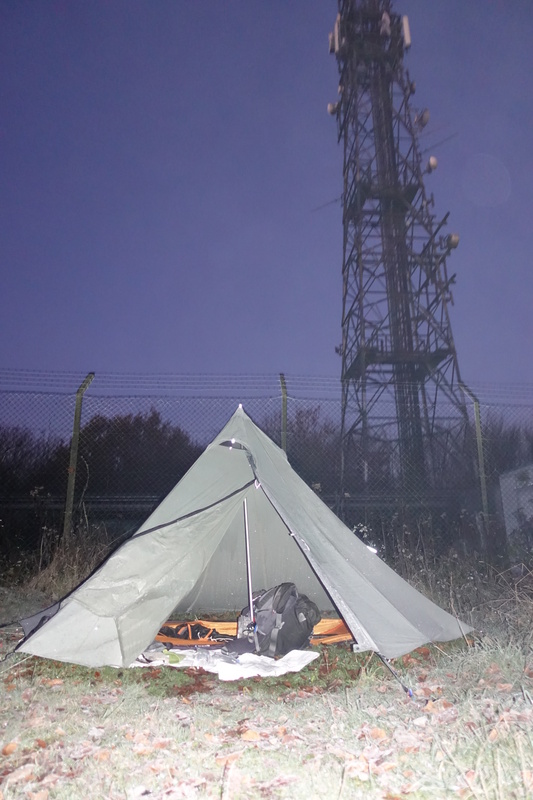 Despite my halts and diversions, Monday was still a hike in excess of twenty one miles but I was less concerned with finding a camp site as tonight’s halt was YHA South Downs. It was still cold but dry, however the blue skies were clouding over and it was obvious that a change in the weather was imminent. I still made time for a halt at a roadside caravan where two huge bacon rolls were consumed. 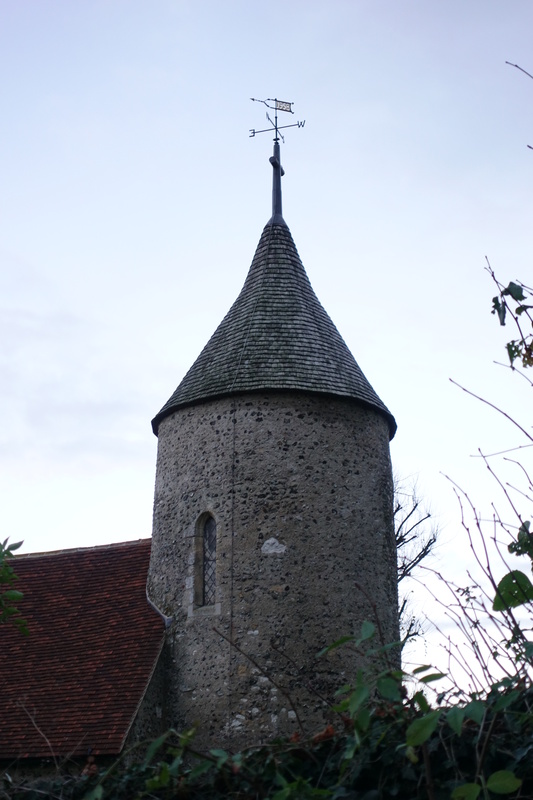 Also a brief halt to admire Southease church with its rare circular tower. There are only two others in Sussex. Having booked in to the attractive Youth Hostel, situated on a farm, I found myself sharing a room with one of the most taciturn men I have ever met, also one of the friendliest! Showered and clean, I made my way to the hostels courtyard cafe where the two young wardens- Chaya and Steph, provided me with a series of good beers and the unhealthiest of food options. I slept well in an overheated room, only a little snoring from the other two occupants. Both were contractors and were away early to their work. 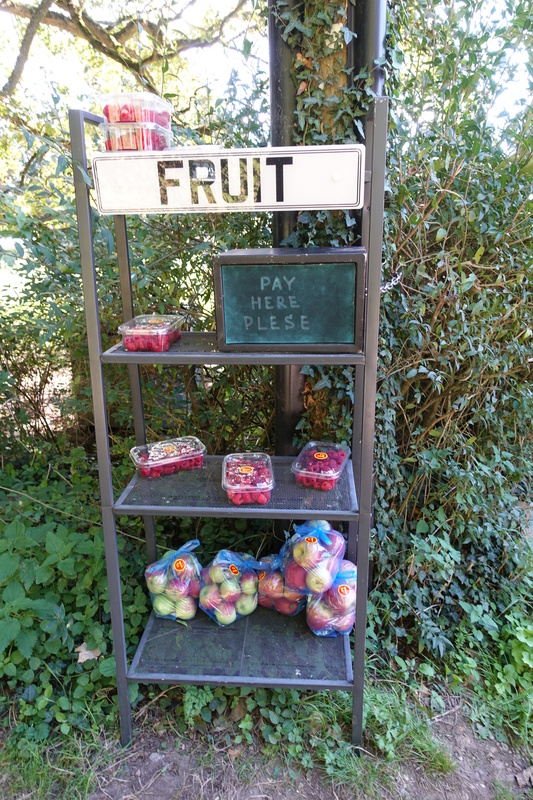 On my final day, Tuesday, I had breakfast in the campers kitchen and was away soon after eight for my walk to the coast, I enjoyed second breakfast at the Singing Kettle Tearoom at Alfriston. I was headed toward the lovely walk along the Seven Sisters via Cuckmere Haven. My final day also had the greatest amount of ascent- 4892′. This was all easy enough though and would make for a great finish to the hike. However the weather had indeed changed and it was rain for much of the day, if it wasn’t raining, it was mostly sleet or hail, such fun! It didn’t really bother me as it was driving in to me from behind or my left, so I was able to keep the hood of my Velez Adventure Lite smock up and was warm and dry to the great extent. My legs got wet but never cold, if it briefly stopped raining, the Montane Terra trousers dried quickly in the stiff wind. 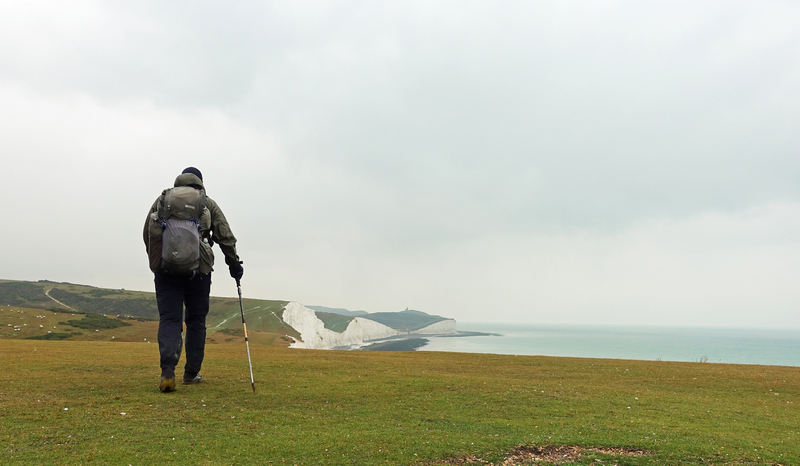 This was almost twenty two miles from the Youth Hostel to Eastbourne Pier where I was finishing my South Downs Way hike. 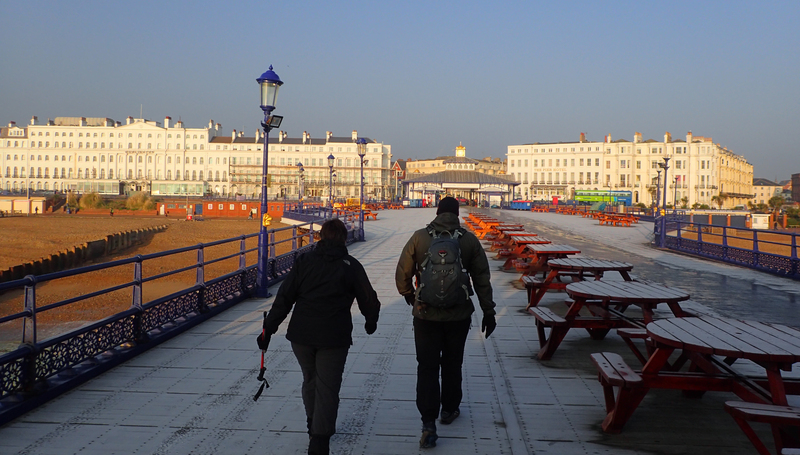 Then about face and another long ascent back out of town to that nights halt at YHA Eastbourne. I arrived before five and had to stand outside until the warden unlocked. This remains a ridiculous YHA requirement that has been largely done away with by independent hostels. I was also less than pleased to find there was no food provided on site and there was nowhere in the vicinity. Not fancying another slog back down into town that night, I was able to rustle up sufficient from my almost totally diminished food supplies supplemented by a little pasta left in the kitchen to make an ‘OK’ last meal. The warden even found a bottle of wine for me, bonus. 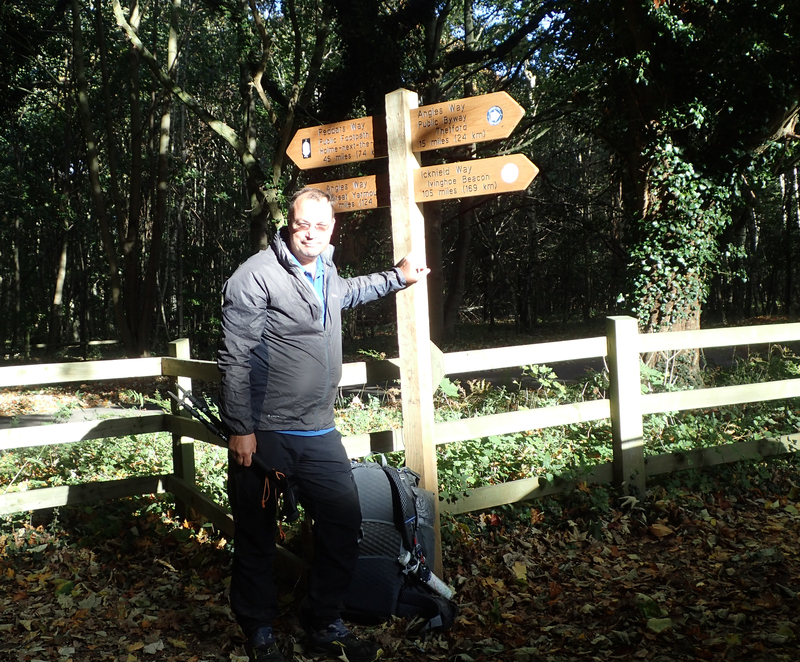 With my little diversions off trail and the extra couple of miles up to my Youth Hostel from Eastbourne Pier, I completed 108 miles over my five day hike of the South Downs Way. It had been a cracking walk. 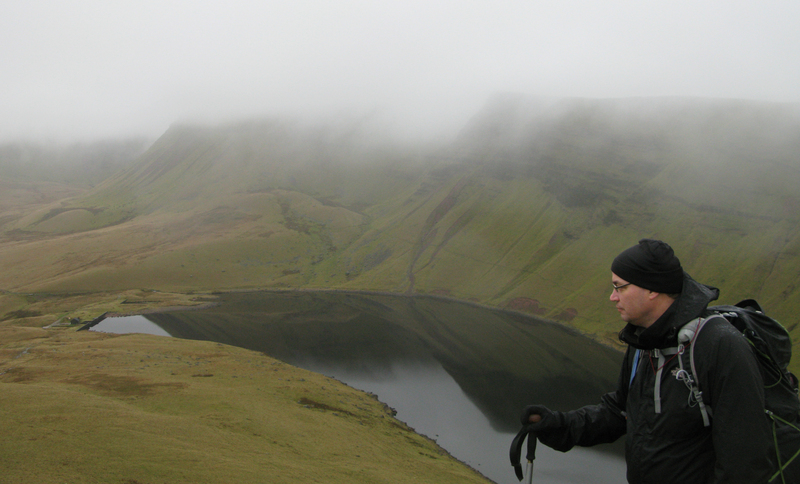 The mist had obscured views at times but it added another element to the walk in itself. This has to be one of the finest chalk downland walks to be found anywhere. I wouldn’t do it again in a hurry but am pleased to have completed it. 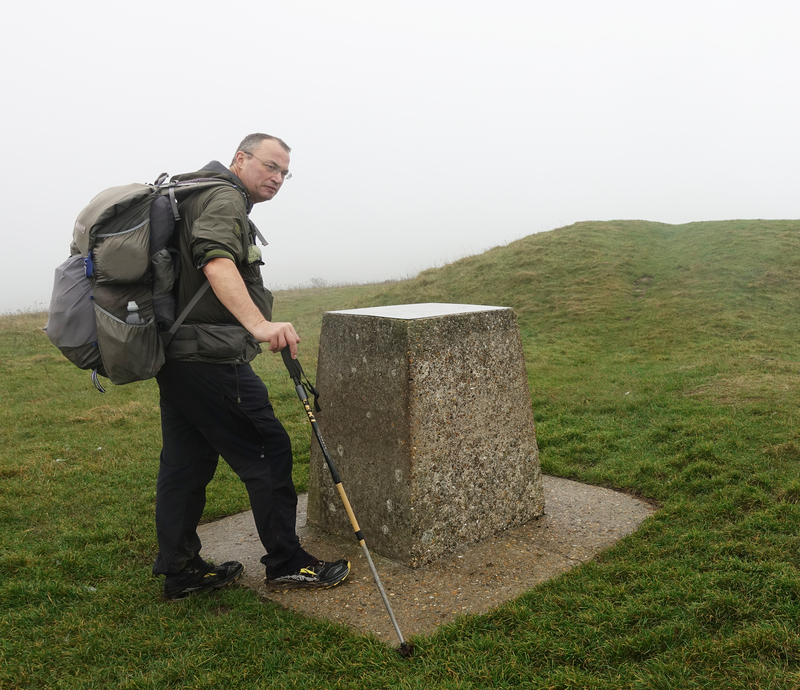 This entry was posted in Gear and tagged camping, gear, Map, path, route, South Downs Way, stove, tent, winter on January 9, 2019 by Jools. 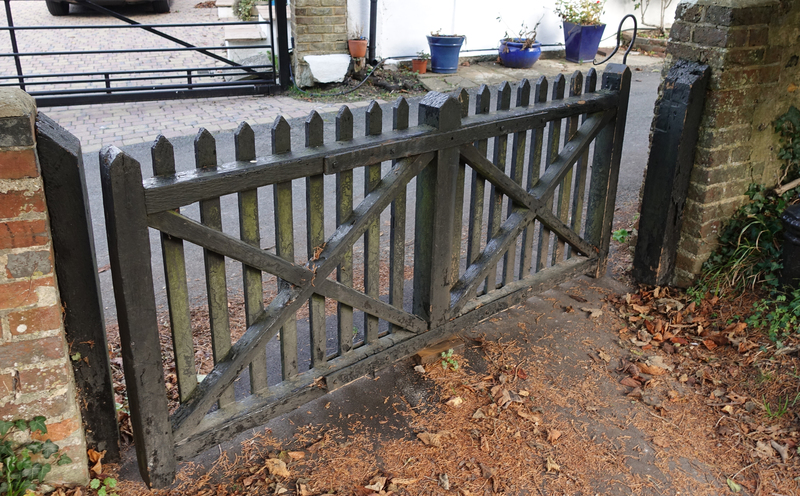 The Wealdway is an 80+ mile/134+ km path across the south east of England, from Eastbourne on the South Coast, to the River Thames at Gravesend. 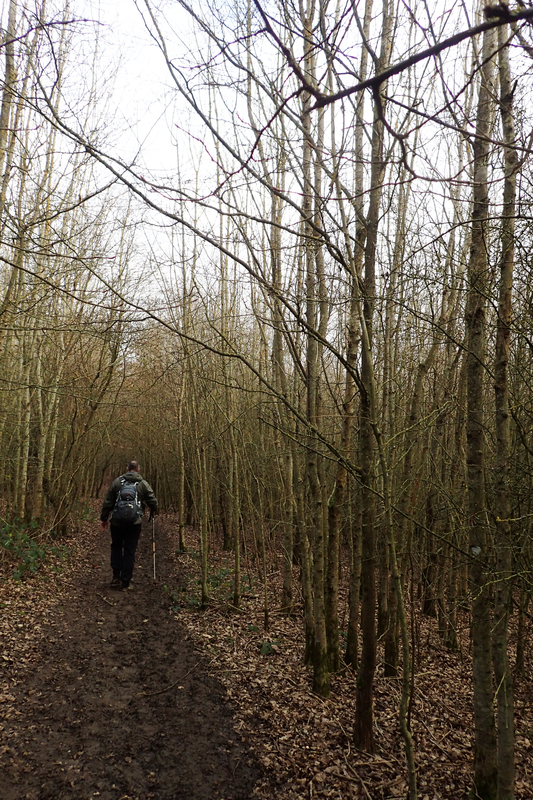 Traversing the Weald, walking northwards from East Sussex into Kent, the route crosses both the South Downs and North Downs. Each year, Three Points of the Compass works through one of the long distance paths in ‘my’ south-eastern corner of England where I live. These are usually completed as a series of occasional day hikes. For the Wealdway, Mrs Three Points of the Compass joined me. We actually commenced this in 2017, intending to complete it by 2018. But with one thing and another, various commitments, not least my completing a five month 2000 mile hike last year, it was not until early 2019 that we managed to find time to knock off our final day on this trail. This is not a difficult walk. Climbs may be moderate, but it it is a very enjoyable traipse though a changing countryside. 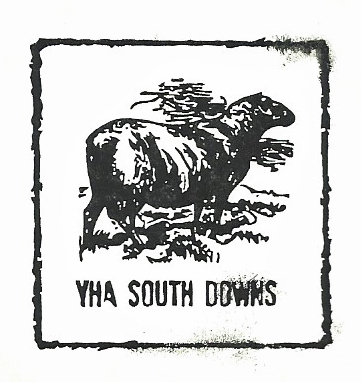 The wide open chalk escarpments of the South Downs and North Downs stand above low lying farmlands. Pasture mingles with woodlands, tiny streams and almost forgotten villages are encountered every day. 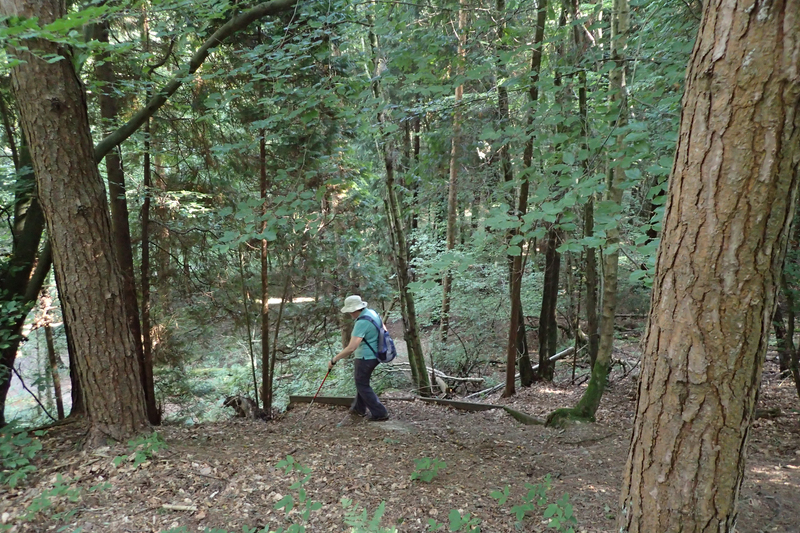 In the middle section of the path, the way climbs, crosses and drops from the High Weald at Ashdown Forest. This bulging geographical anomaly is beautiful walking, the term ‘forest’ is slightly misleading, it being more sandy heathlands and gorse, with stands of pines. There is not much written about the Wealdway. 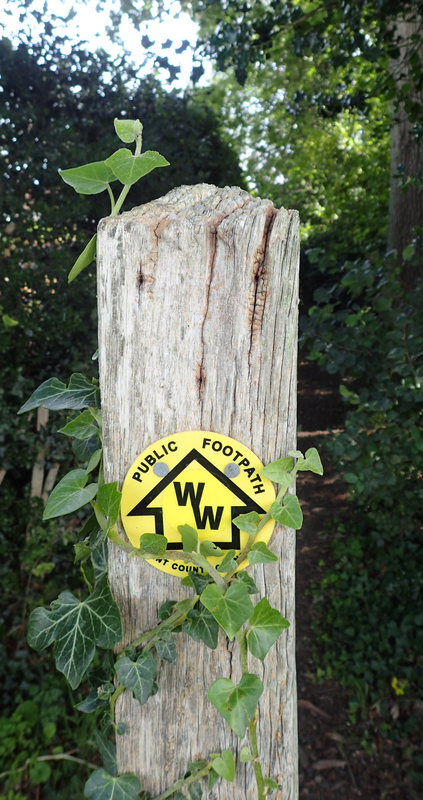 I am not sure why as it certainly rates amongst other longer trails in Kent and Sussex though just a couple of other bloggers have written about it. There are GPX files but as it is marked on O.S. maps and I prefer hard copy maps, I carried the relevant O.S. Explorer map for each days hiking. The whole route is covered by O.S. Explorer 123, 135, 147, 136, 148 and 163. I preferred the larger scale 1:25 000 Explorer maps to the 1:50 000 Landranger maps as it is helpful at times to see which side of a hedge, ditch or stream that the path was following. 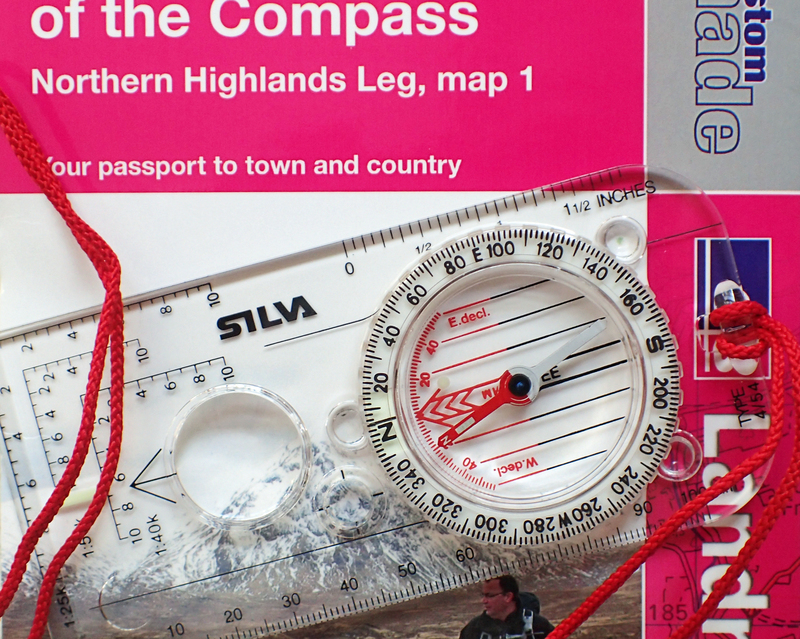 I carried a compass but probably used it on no more than two or three occasions. I carried the most recently written guide with me on occasion, but more for lunchtime or train reading en route than anything else. 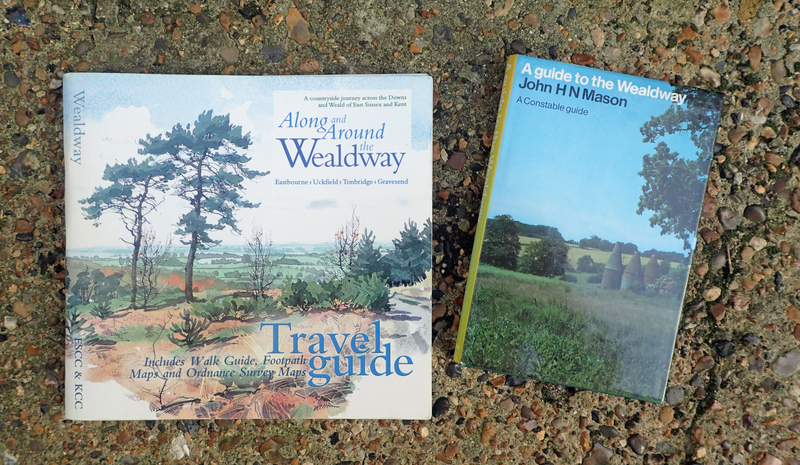 A guide to the Wealdway by John H N Mason was published in 1984 and there are a handful of changes to the route shown in his guide. Despite this, the researched notes make for interesting reading and if you can find a second hand copy, it is useful if you intend to enjoy this route. 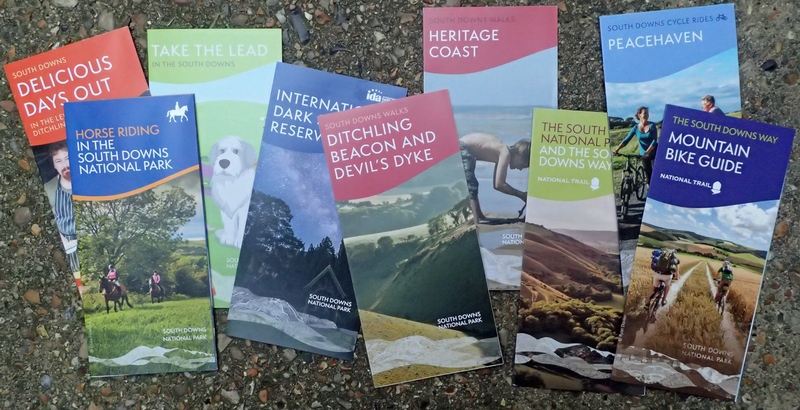 The most recent printed guide is Along and Around the Wealdway. This guide was researched and authored by Helen Livingstone and was published jointly by the East Sussex County Council and Kent County Council in 1999. It is attractively produced with lovely photographs and paintings. However its design is hopeless, the size and shape are not conducive to stuffing into a pack and it has a ‘pull-out’ centre Walk Guide. I never camped on this trail, or stayed overnight. When hiking, we travelled each day to and from railway stations that were never more than a mile or so off route. That said, while various guides give the total distance of the Wealdway as between 80 and 83 miles, these station link miles do add up and we covered 97 miles in total over the six day hikes it took to complete the trail..
Three Points of the Compass does like to explore a church or two en route, or at least take advantage of a seat in the churchyard for a lunchtime halt. 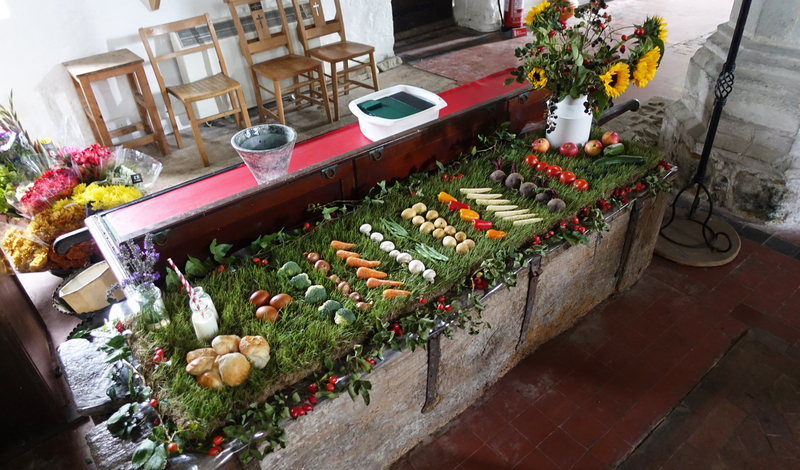 Beside pottering around fonts and pews, admiring stained glass and tombs, a peek inside the interior would frequently encounter the makings of a cup of tea with biscuits provided, laid on by parishioners in exchange for a modest donation. Very welcome on hot and colds days alike. The Wealdway crosses differing rock strata, each of which has leant itself to different building materials and architecture. Thatch, wood, brick and hung tiles proliferate. Black & white timber framed houses and barns abound. Farms vary from the tatty and unloved to the grand and expensive. Wealden wooden braced halls alternate with flint walled churches. It really is a joy and if walking alone, I would probably have taken more time to halt and sketch en route. We will never really appreciate just how much the countryside has changed around the Wealdway. While the hills remain largely the same, other than the ravages of quarries and road cuttings, the wooded slopes have largely gone, torn down to fuel the iron furnaces or build the warships, cleared to make fertile land for farming, or make travel easier across a former dangerous place for a hunter gatherer or traveller to be. More modern coppice woodlands- chestnut especially, or beech, oak or coniferous, depending on soil type, remain if much reduced in acreage. However the remains of the prehistoric races that lived here are in evidence. The remains of Bronze and Iron Age forts are passed, the ‘Tumuli’ shown on the O.S. maps are often worth a bit of an explore, especially sites like Coldrum Stones just below the North Downs. 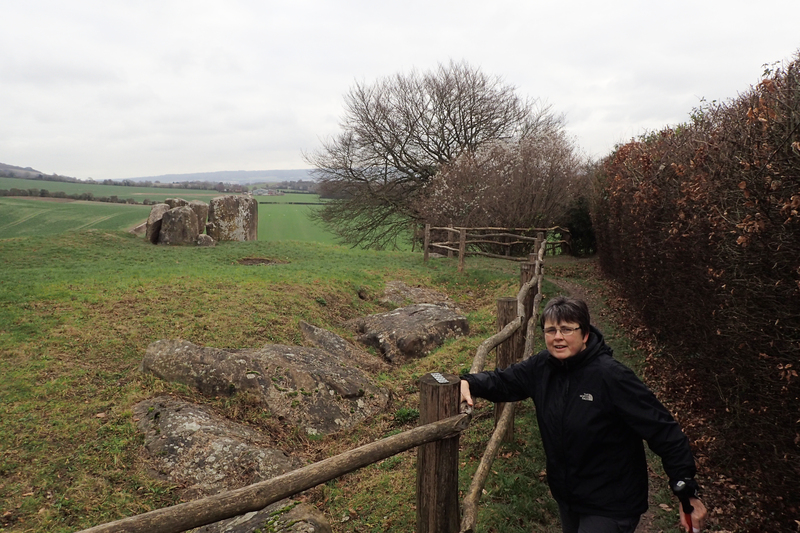 This long barrow differs from others found in England, being more akin to those tombs found in Denmark, which belong to the earliest Northern European neolithic culture. Mrs Three Points of the Compass and I thoroughly enjoyed our time on the Wealdway. Travel to and from each days section was easy by public transport and each day bought something new. Even when the clay soils were wet, the going was never particularly tough and our six days were spread across all the seasons so we got to experience it in all weathers, we even did one section twice, if unintentionally! I thoroughly recommend it to anyone that wants a gentle and fairly short introduction to the diversity of Kent and Sussex. 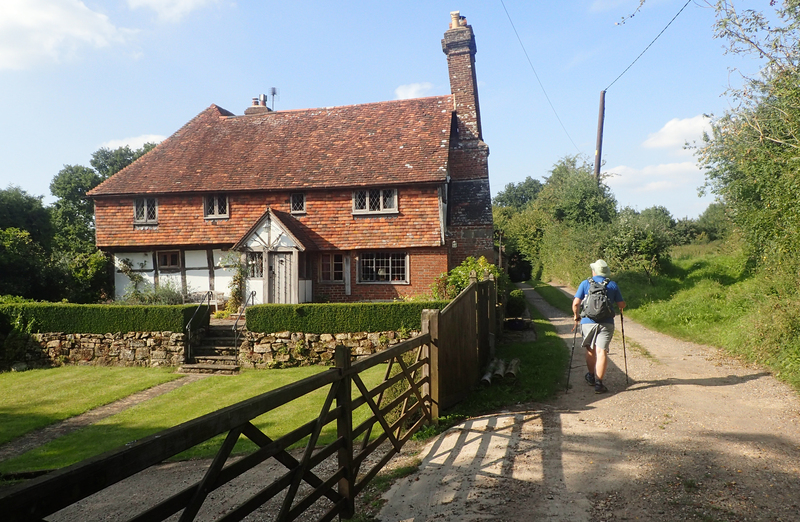 I loved walking in out of the fields and woods to briefly pass through a tiny almost forgotten village, briefly ponder whether to pop in to one of the pubs or not, reluctantly decide against it (miles to cover) and walk on back into the Weald. 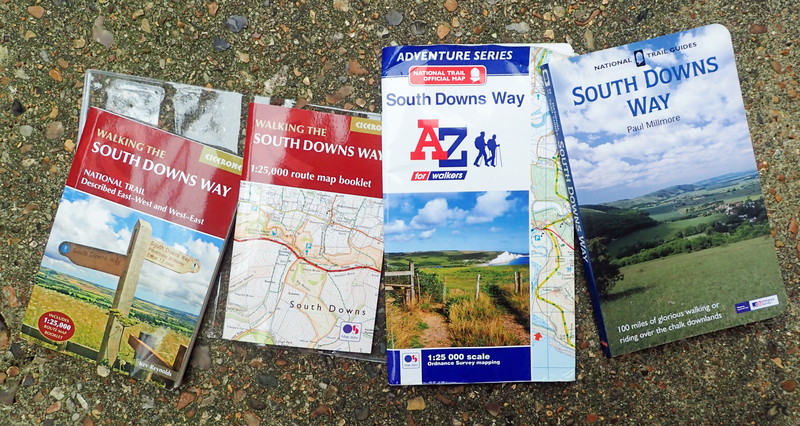 As to my next day walk trail in the South East, more on that in the future. This entry was posted in Uncategorized and tagged Map, navigation, path, route, sign, Wealdway on January 5, 2019 by Jools. In less than a week I am setting off on one of the longest, most beautiful, rugged, long distance walks in the UK. This is the South West Coast Path, and its 630 miles will be the springboard into the rest of my walk the length of the UK. 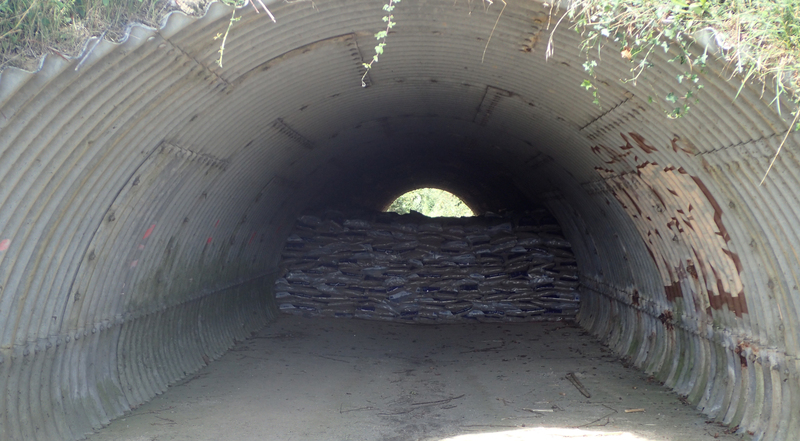 Being a coastal route it passes through or near many towns or villages and I anticipate little difficulty in resupply of food. That said, I am setting off from Poole with a handful of meals and some longer lasting supplements I found time to tuck into my food bag. 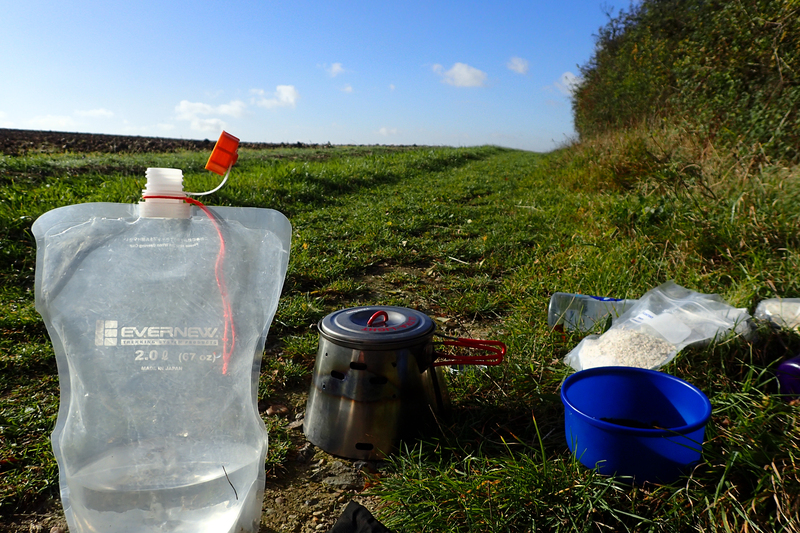 For the first two evening meals, I am taking the hiker’s staple- a couple of simple noodle meals. Mine are the ‘Fiery Sweet Chilli’ Fusion noodles from Maggi. Not only do these have, in addition to the noodles, the standard bag of flavouring, albeit superior, with dried veg, they also have a little sachet of Sunflower oil for extra flavour and calories, though I wish this were Olive oil. Another staple being carted along are two packs of the Idahoan dried potato flakes: Butter and Herb, and Roasted Garlic. Each of these will have protein added in the form of a pouch of Tuna. With over half of its weight consisting of protein, 70g of Yeast Flakes in a zip lock baggie provides additional protein to a few meals in the days to follow, as does 60g of Freeze dried Grated Red Leicester Cheese, in zip lock baggie. These can be added to just about any meal to boost it slightly. Breakfast for Three Points of the Compass usually consists of porridge with added milk powder, so for the first three days I have six ‘Oat So Simple’ sachets (Sultanas, Raisins, Cranberry & Apple and Blueberry & Banana). After that, it is whatever I can find. 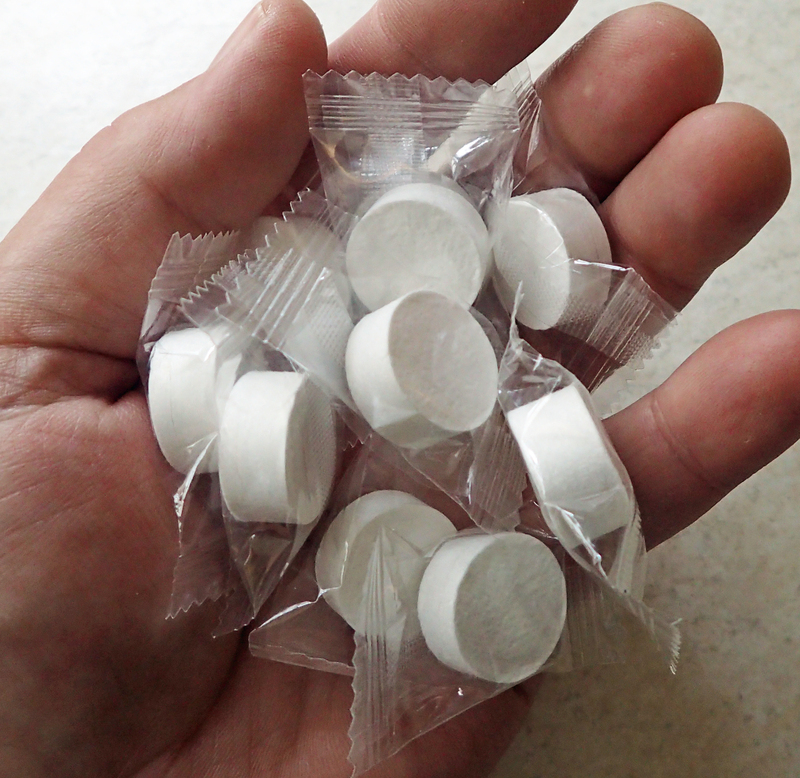 Other than water, for hot drinks in the first week or two I have ten OXO cubes- I like one of these at the end of a days walk immediately after having set up camp. No low salt versions of these for me, these are the full fat, harden your arteries, cubes. Also, 30 decent tea bags will last me a fortnight or more. I am not a fan of full fat milk in tea but will have to learn to accept it as I am also taking 200g of full cream Nido dried milk powder in a zip lock baggie. I have a little plastic 1.5g medicine measuring spoon in this as I find it preferable to use one of these rather than my Ti spoon that has been used for stirring, tasting etc. I have chatted before about taking a small number of condiments and flavourings, my chosen selection should last many weeks. The ten tough 1 litre ‘Soup ‘n’ Sauce’ bags I am tucking into my cuben Z Packs Food Bag will be washed out periodically and will last quite some time. These save considerably on the mess when preparing oatmeal, noodley or mash type meals. They can simply be fastened after the cooked contents are consumed, to be washed out at a later stage. Also for the first couple of days I am carting along some snacks- three different Kind bars, easily the tastiest of this type of bar, also a single Cypriot peanut and sesame bar found sitting in a cupboard after last years holiday to Cyprus. After those are consumed, it is probably locally purchased Snickers bars from them on. My gear list is just about finalised, and so it should be, I hear you cry. I continue to drop the weight being carried where I feel I can do it sensibly. 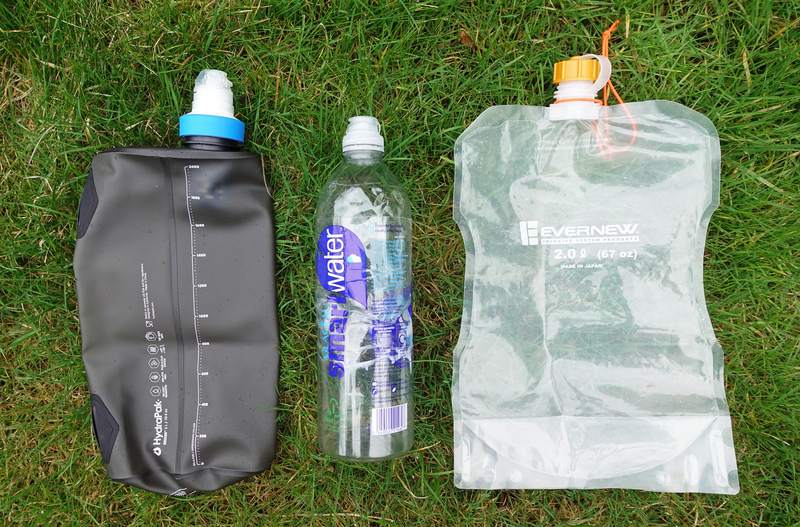 I wrote only a few weeks ago, about the excellent MUV water filter that I had initially planned on taking with my equally new Cnoc water bladder. At the time, I had concerns about the weight and subsequently decided to simplify my set up, shave a few grams and just take a BeFree filter screwed into a 2lt Hydrapak Seeker. I remain concerned about agricultural run-off in lowland Britain and will have to exercise greater caution as regards this. 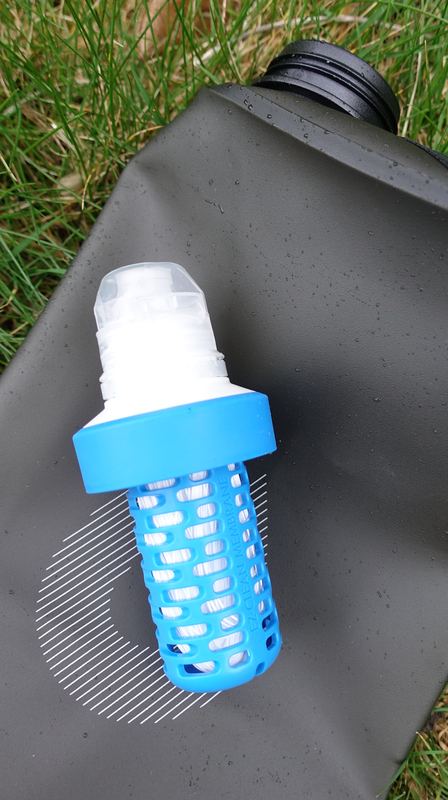 The BeFree filter weighs just 35g and will handle up to 1000 litres of water. If this proves insufficient for my hike I shall simply order another BeFree filter or revert to the MUV 2 Module that can be sent on to me via Mission Control back home. The filter can be cleaned ‘in the field’ via swishing or backflushing. The flip top cap does a good job of keeping the mouthpiece clean. For clean water I have a 2lt Evernew bladder and an 850ml SmartWater bottle. With a combined capacity of around 4.8 litres, these all weigh a collective 174g when dry. A fairly significant drop from my previous 342g set up. Recently I have been concentrating on getting a few necessary jobs completed prior to my leaving next weekend. The car has had an MOT, the lawn had its first cut of the year (Mrs Three Points of the Compass– you are on your own with the mower now! ), a decent haircut and the last weekend saw a bit of packing, general household chores and most enjoyable of all, a couple of farewell type family meals. Oh yes, and a number of pints of beer were drunk too. Someone said, drink the water, but I will drink the wine. Someone said, take a poor man, rich don’t have a dime. So fool yourselves if you will, I just haven’t got the time. If you can drink the water, I will drink the wine. Someone gave me some small flowers, I held them in my hand. I looked at them for several hours, I didn’t understand. I’ll give back your flowers, and I will take the land. And I will drink the wine. Sometimes I’m very very lonely, there’s only me to care. And believe in a world that is mine. Someone gave me flowers, held them in my hand. Looked at them for many hours, didn’t understand. And I will drink the wine, and I will take the land. I will drink the wine. This entry was posted in Cooking, Food, Hydration, Planning, Uncategorized and tagged camping, Food, gear, Hydration, LEJOG, route on March 12, 2018 by Jools. Thirty-five days until I set off and I am still umming and ahhing over a small number of route choices. Occasional evenings are spent in firming up these choices, while also including a handful of more direct or low level alternatives in case I am running slow or the weather is absolutely foul. It is my walk, my route and I am attempting to include many places of interest to me, either for their historical aspect or natural beauty. The daylight hours are spent at work. There are a number of things I need to finish off, pass to someone else, or put on hold until my return. I finally received official sanction to include some unpaid leave alongside an extended holiday and include days I have been able to bank over the past decade. This is an important aspect of planning. I may be away ‘enjoying’ myself, traipsing up and down the country, while also spending money on food, fuel and some overnight halts. But back home there are still bills to be paid. 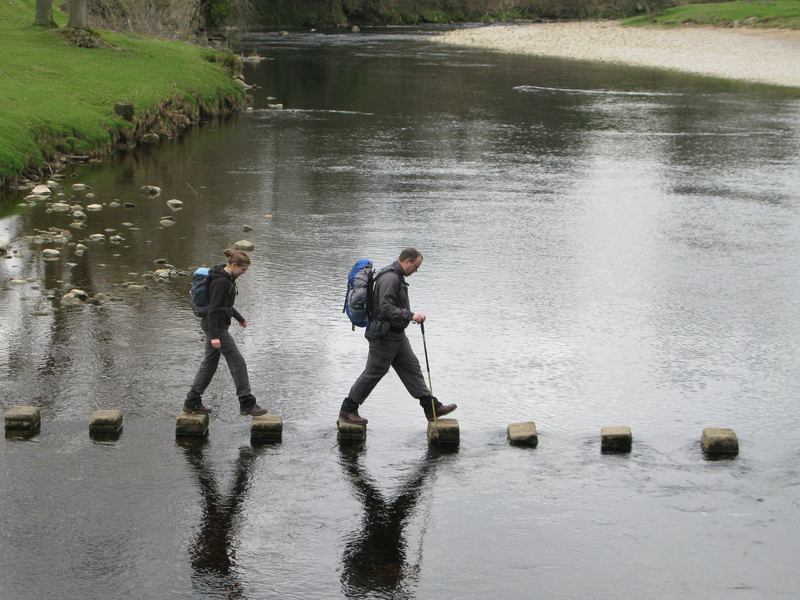 Budgeting is something not to be forgotten when planning an extended hike of significance. I am fortunate that not only do I have an understanding and supportive manager, but also still have a job I enjoy to return to afterward. For some unknown reason the weight has crept up, now 36g rather than the 31g of my previous pair. 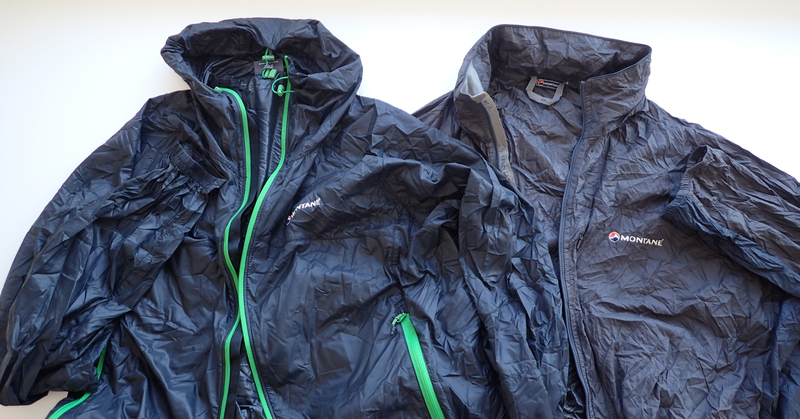 It was also time to replace my battered Montane Lite-Speed windshirt/jacket. My old one that I have used on just about every UK hike over the past six years was beginning to fray at the edges, a fair bit of hem stitching had come adrift and even though there are quite a few miles left in it. I still felt a new replacement would last a good deal longer. I ordered mine through the Cotswold Outdoor website for collection in store and descended on their Maidstone premises yesterday. I reckon this windshirt is a cracking piece of kit and find myself often wearing one, especially when setting off in the cooler temperatures early morning, or on breezy ridges where simply cutting the effects of windchill is all that is required. I find it also often works well as a mid-layer, trapping an insulating layer of air. The 2018 Montane Lite-Speed is a fairly simple garment, constructed from 20 denier Pertex Quantum Mini Rip-stop, this dense weave nylon is both light and 100% windproof. It has an adjustable roll away hood with some stiffening in the brim. The hood doesn’t now roll away as well as it previously did. My 2012 garment had it folding away into the collar while the newer model simply rolls up to make a fairly loose collar in itself. 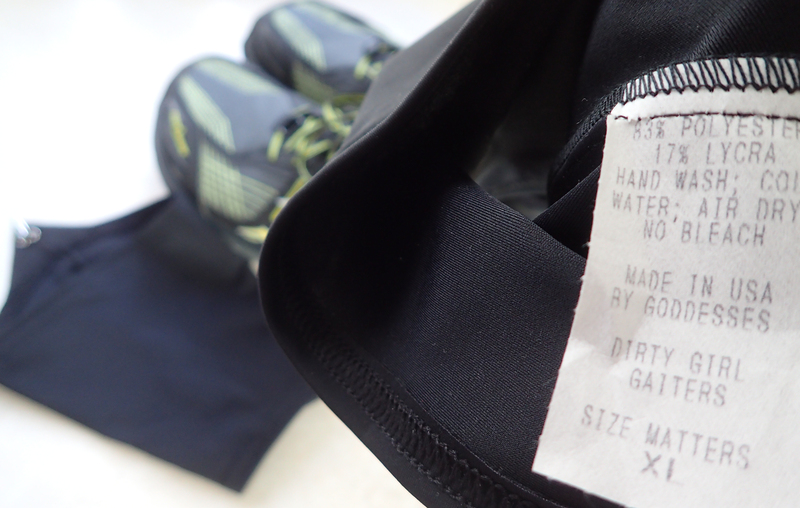 There is a full length front zip with internal wind strip and zipped hand pockets. These are an improvement over my earlier model that only had a single chest pocket. The earlier shirt was made from Pertex Microlight and the previous 9g mesh stuff sack (always a squeeze to get the jacket into this) has been changed to a slightly larger 6g Pertex Quantum stuff sack. This is so light and handy that, at least for now, I shall be keeping it stowed in this if not in use. The weight has dropped a little too- from 196g to 167g for my size XL. This entry was posted in books, Gear, Planning, Uncategorized and tagged book, Clothing, feet, gear, LEJOG, Map, navigation, path, route on February 25, 2018 by Jools. The off grows ever nearer, half a hundred days away. So what am I up to? I am still planning, my route underwent a bit of a change as I have now decided that it is best to complete the Offa’s Dyke Path and from there cross over to the Peak District, rather than my original intention of only completing half of the Path and leaving at Knighton. This meant that not only did a handful of new maps have to purchased, but a bit of reading around my new route was required. I am now following part of The Great English Walk from Tarporley to Youlgreave. This looks an interesting section in a ‘difficult’ part of the country to cross. So along with maps and books arriving in the post, I was delighted to finally receive my footwear of choice. Cutting it finer than I would want, but I can now begin adapting the insoles to take my orthotics. The latter became necessary when I found myself suffering from Plantar fasciitis in 2015, a problem that still lingers with the occasional twinge. I am going to have to ensure I keep up with my stretching exercises when on trail. I have also been receiving small items ordered, some paint for my art kit, a new compass to replace the one that I have been using for years, but has an air bubble that appears at certain temperatures. I would like to have booked my train to the start, but am unable to. While I have ‘agreement in principle’ from my work place that I can take my extended break, this has yet to manifest itself in an official ‘yes’ from HR. As soon as it does, then the train gets booked. Beside adding weight to my pack as small items of gear are purchased, I am also working on the easiest way to take less on the trail, i.e. losing a little weight. So my diet has also been addressed. Three Points of the Compass is, ahem, a big lad, so I am making a point of addressing this before the miles on trail take yet more pounds off. I’ve also being checking that my cook system is as I want it and renewing some older items in the First Aid Kit. Beyond that, a visit to the dentist and booking my car in for its annual service and MOT before I leave. There are still quite a few preparations to be made, I’ll keep you informed. This entry was posted in Planning, Uncategorized and tagged gear, Knowledge, navigation, path, Planning, route on February 10, 2018 by Jools. I recently did a brief post on how I was getting on with cleaning knives and multi-tools at home, while struck down with minor illness. 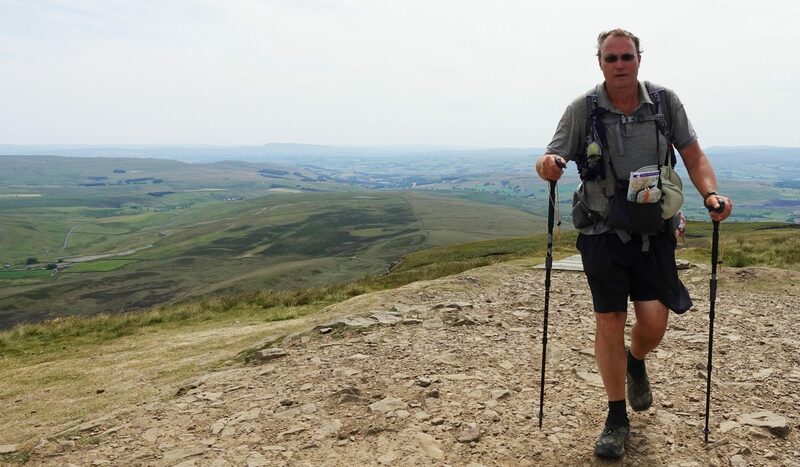 In a response to this, one reader, Sam, asked a number of questions on how my plans are progressing in the remaining days leading up to my setting off on my Three Points of the Compass walk. Rather than have my reply buried elsewhere, I have done a dedicated response here should such things be of any interest to anyone else. As I post this, I have just sixty days until I set off. Naturally, as my start day approaches, there are a mixture of emotions. I am nervous about my arthritis in feet, knees and hips and my lingering plantar fasciitis, I am exhibiting slight apprehension over my gear choices- have I ‘packed too many fears’, I am questioning of the weather that I will encounter in the spring, worried about leaving my wife and family for so long, concerned at being absent from my work for such an extended period, doubtful that my order of three pairs of Altra Lone Peak trail shoes in size 13 will turn up in time, and yes, I am very excited at my approaching adventure. Do you have a specific goal in mind, as in, for example, the number of days you would like to complete the walk in? Or each section of the walk? Do you plan on going all out each day, walk till you drop, see where you end up, and repeat? When I was a younger and stronger hiker, I would walk as far as I could each day. In my twenties, thirty to forty mile days were not unremarkable. In my thirties and forties, this had dropped to seldom above twenty-five mile days. With dodgy knees and other issues, I cannot carry on like that. I have to rein myself in and complete shorter days. Most definitely when I set off, otherwise I will not complete this walk. I am anticipating that I will complete between fifteen and twenty miles most days. Some will be shorter than this, some will be longer. In my head, I have a regime of a majority of wild camps, interspersed with occasional official camp sites where I can shower. I plan on the occasional bit of luxury, perhaps a B&B or cheap hotel or hostel. I am hopeful that these can more or less coincide with a day off from hiking roughly once a week. Nothing at all is booked beyond friends of mine in Somerset expecting me to pitch up on their lawn for a night or two at some point. Do ask if you have any more questions that you would like answered. This entry was posted in Gear, Planning, Skill, Uncategorized and tagged camping, gear, Knowledge, LEJOG, Planning, route, Skill on January 31, 2018 by Jools. 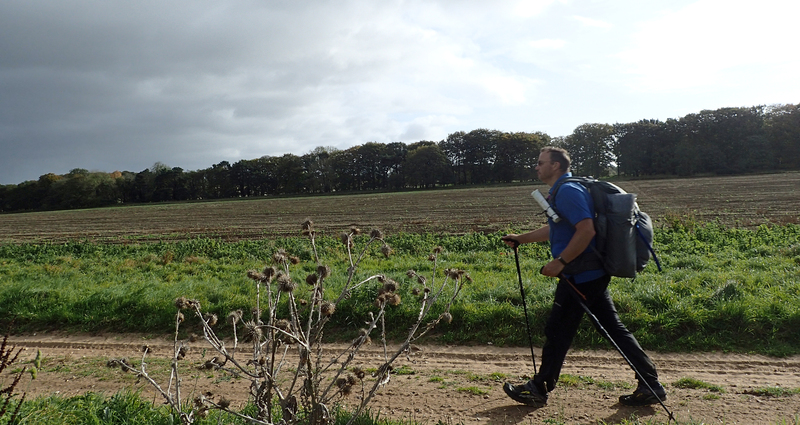 My last post covered my recent six day hoof across the Icknield Way Trail. 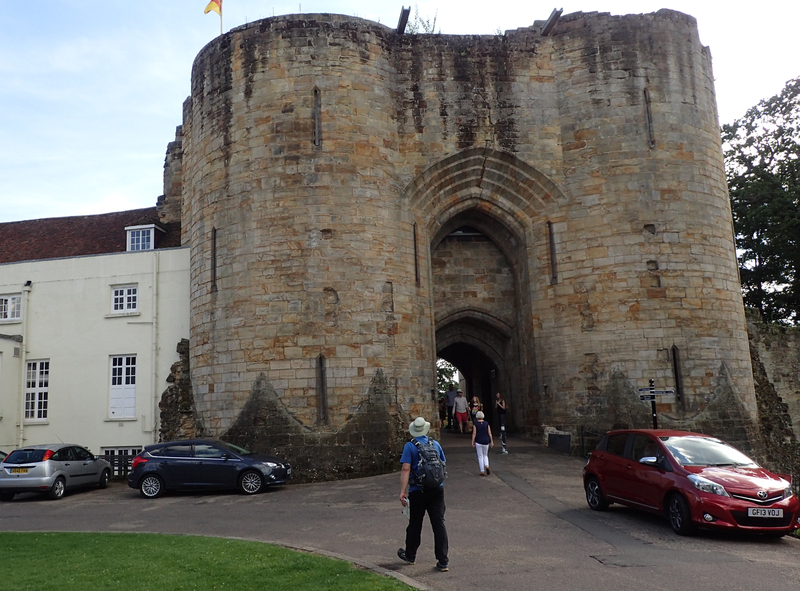 With a bit of wandering, also a mile backtrack to retrieve a map I thought I had lost, but hadn’t, and one or two momentary periods of confusion when my route abandoned me in a couple of towns, I covered 120 miles. I used this walk as an opportunity to further drill down my gear selection for my Three Points of the Compass walk commencing 1st April 2018. I thought I was just about there, but even at this point, I realise I still need to drop a handful of items, change a couple of others and make one, for me, large change in my approach. 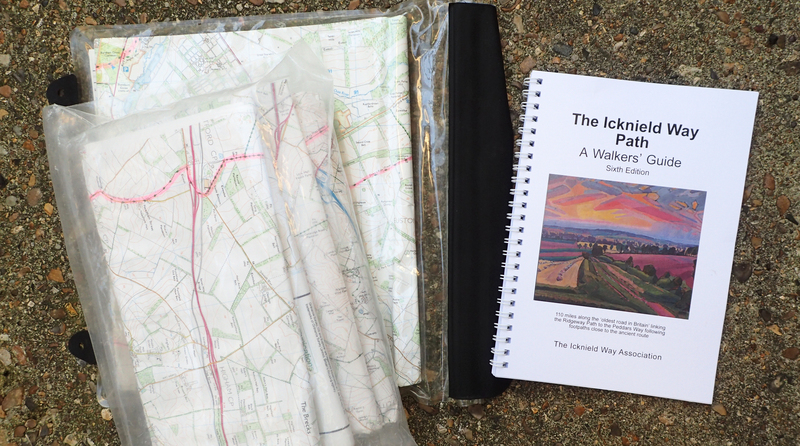 I’m not going to cover everything in this post but if you want my thoughts on any item in my Icknield Way gear list, do ask. I had taken a tall thin cuben dry bag for the tent. 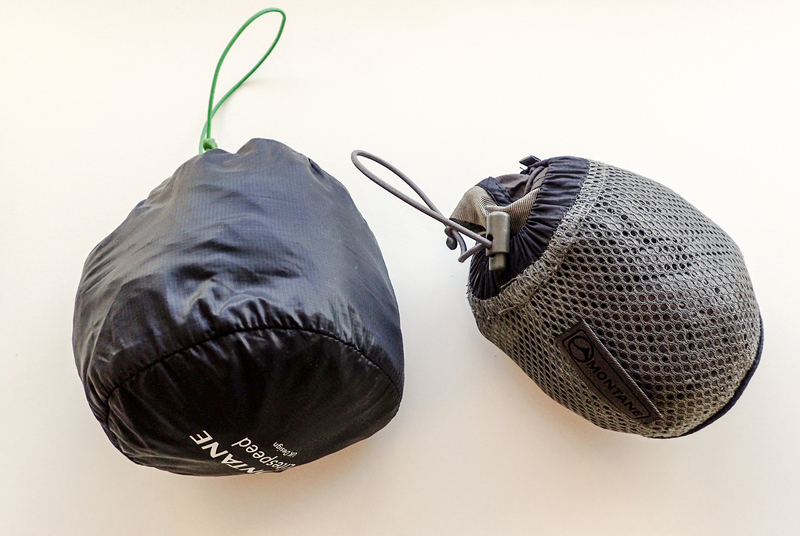 This fitted the long ‘wand’ pocket on one side of my Gossamer Gear Mariposa pack well. I had to take care to roll the shelter tightly otherwise it was a pig to get into the drybag. Many people fixate on the condensation issues inherent in single skin tents. Obviously I have much to learn and experience with this tent, but I found condensation no more of a problem than with a double skin tent. Ventilation is everything. On three nights I set up well, had a through breeze and had zero condensation. I did have a wet interior after a night camping on long wet grass. None dripped on me and my feet and head remained clear of the wet interior. A wipe down with a bandanna in the morning sufficed. If anything, this was handy as it gave me a clean water soaked cloth for a wipe over of my body. The other night had just a little condensation, not enough to worry over. 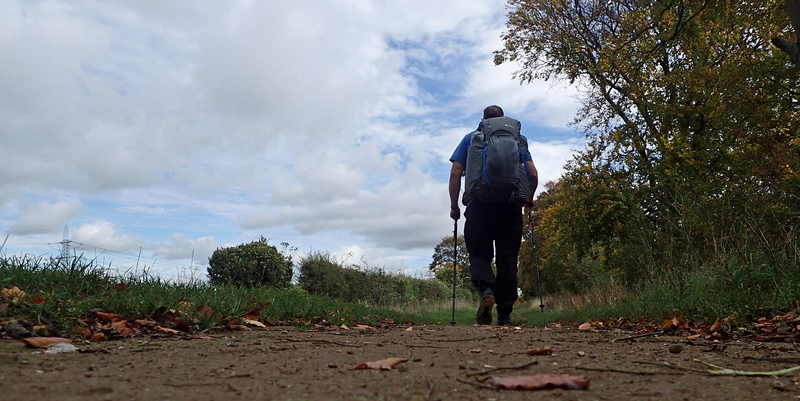 I purchased by Mariposa pack in 2016 and had already used it on couple of hikes prior to taking it with me on the Icknield Way Trail. This was my one piece of kit to break on me, the first breakage I have experienced for some years beside the wearing out of trail shoes. 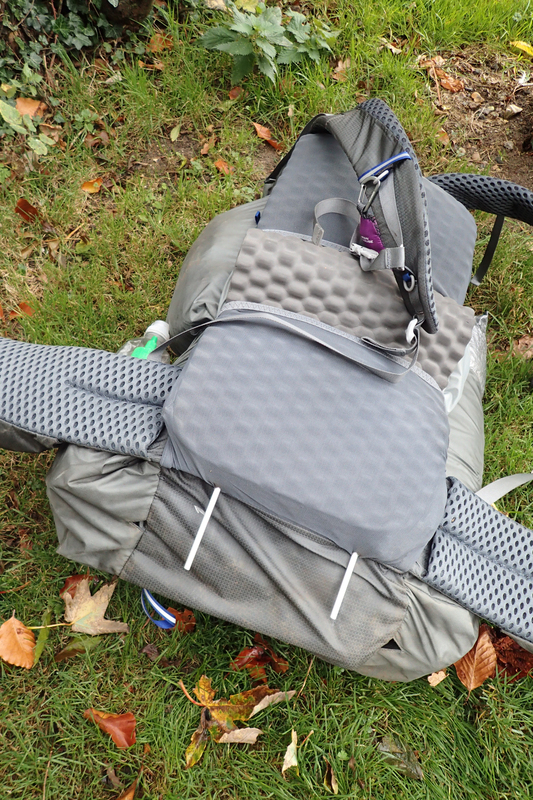 Some say that lightweight gear isn’t robust, I have found that if properly looked after, such gear is usually no less robust than many a cheaper, heavier option. Within a week, I received the replacement belt. I cannot fault Gossamer Gear’s customer service. While an annoyance. I believe the caps on the end of the stays should prevent a re-occurrence so am more than happy to continue with what is, overall, an excellent pack. The external pocket configuration is exactly as I like it and I find myself using the external stretchy mesh pocket on the back far more than I initially thought I would. For example, it is very useful for putting wet socks in to dry. 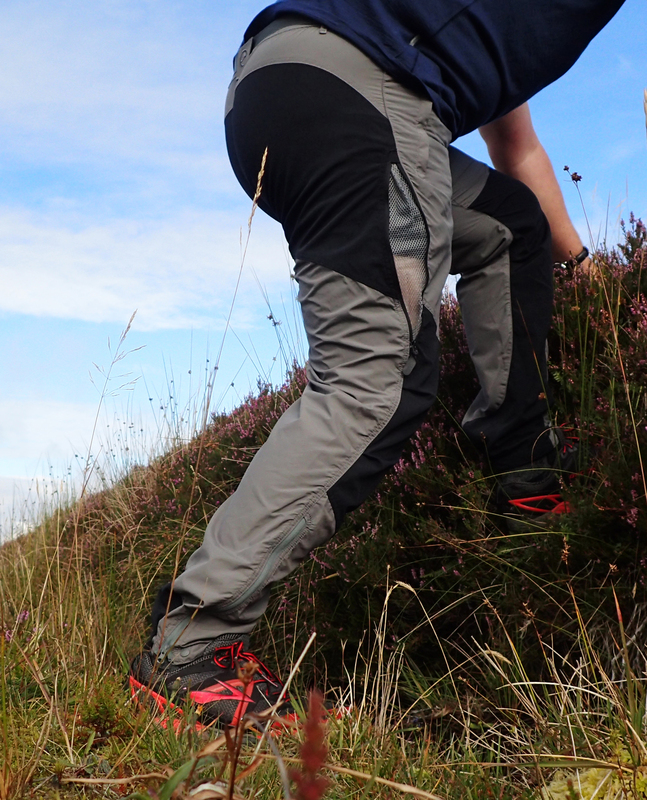 Montane Terra Pants, these are the ‘graphite’ coloured version. Note the side zips on the leg to provide additional ventilation. Photographed on Inishowen Head, Co. Donegal, Ireland in 2015. For this walk, Three Points of the Compass took his normal choice of leg wear, the Montane Terra Pants. I have used these for years and will continue to do so until something better comes along. Not light at 367g (including 29g belt) for a size XXL. They are a tough product with a couple of features that I really like. The side zips on the leg are fantastic for a bit of ventilation and the side poppers on the fairly narrow ankles stop an excess of material flapping around. Really useful in muddier conditions which helps to keep the lower part of the trousers much cleaner. I do wish I could find a lighter option though, that still has these features. I wish there were a side cargo pocket too. I took far more in the way of electronics and gadgets than I required for a walk of this length. Again, this was a deliberate decision to try and duplicate as far as possible the gear I am taking with me on my long hike next year. It may have transpired that I required something from my ‘electronics bag’, as it was, all I needed was my phone. 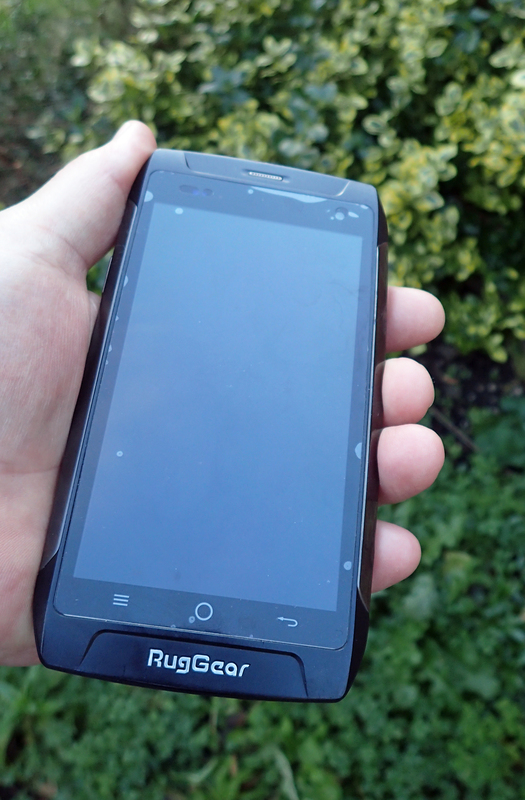 Three Points of the Compass uses a RugGear RG730 android phone. Not particularly lightweight at 215g, it is a rugged phone, rated IP68, so I have no need for an additional protective case. 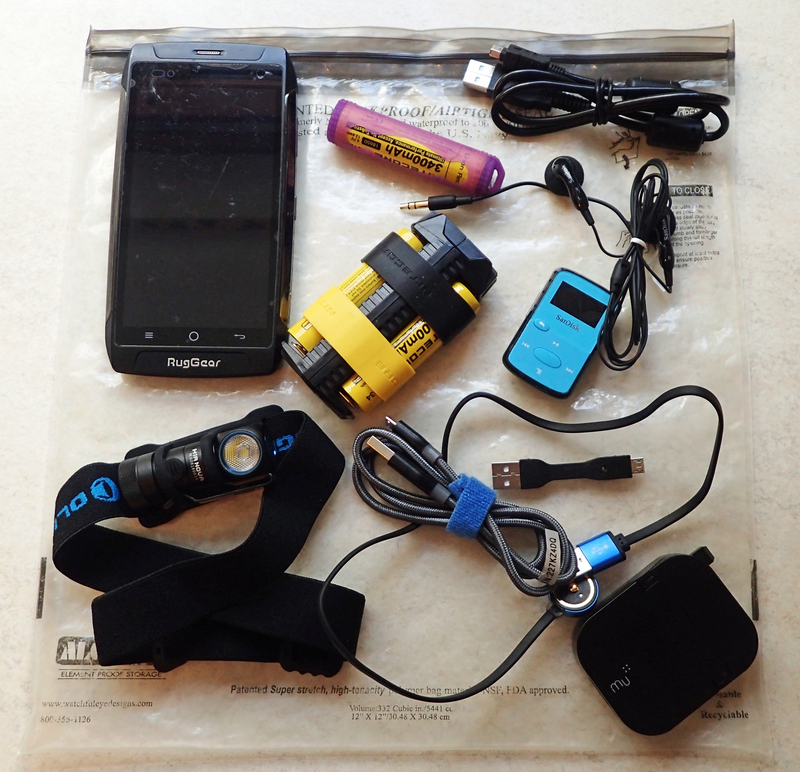 This saves me a little weight, however I do keep it in a poly bag, usually with other electronics, as I am not daft. I don’t use it much on trail and keep it switched off if not in use during the day. On the Icknield Way, I sent daily messages to my wife and daughter, keeping it switched on for a few hours each evening. I also used the OS Locate ap once just to check my co-ordinates, and accessed the web over two pub lunches. Where it was probably most useful was when calling for a taxi at the end of my walk. The Icknield Way finishes at a car park in the middle of nowhere. I found that there was no service with 02 in that locale. Fortunately, another reason I chose this particular model of phone came to the fore. It is a Dual Sim phone, so I switched to Vodaphone, obtained a signal and Bob’s your Uncle. From a 100% charge when I left home, this had dropped to 66% by the end of the walk. I never had the need to charge it at all, despite having the necessary lead and powerbank with me. The RG730 has a 13mp rear camera, but beyond a few photos sent to my daughter on the phone, I use my Olympus Tough TG-4 camera for capturing photos. I am very careful to be as frugal as possible with my meths stove. I light it, pan of water goes straight on and the flame is extinguished as soon as the water is heated. Unused fuel is then retained in the tightly closed burner for the next use. I have long preferred meths (alcohol) for cooking with. I find it pretty much fuss free, silent and my little burner, when combined with the very efficient Caldera Cone, is as efficient a system in a breeze as you are ever likely to find. 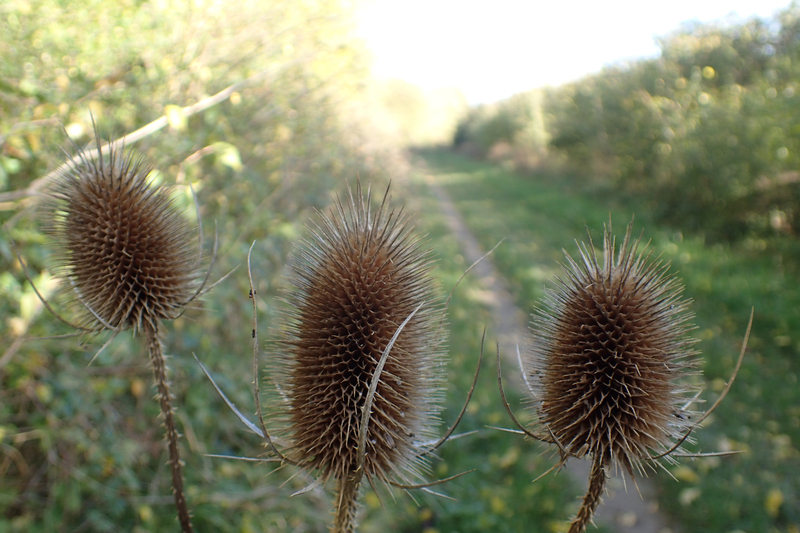 I have no real issues with my system, particularly for shorter jaunts such as the Icknield Way. 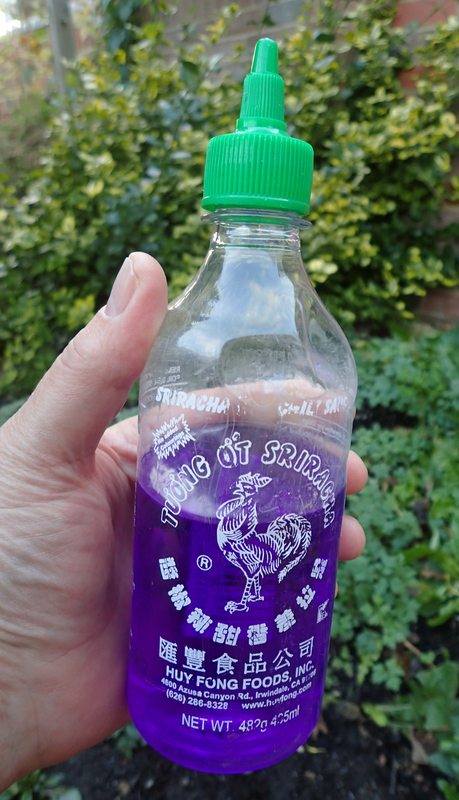 I store my fuel in a bottle that use to hold hot sauce, this has a nozzle cap for directing and controlling the fuel issued. My MYOG meths burner worked very well. So well that I will certainly use it unaltered when using this system again. Over six days of walking, with five nights of wild camping, cooking meals and making hot drinks, I used just 179g of fuel. However I do recognise that the maths has been done by others and gas does come out as a lighter and more efficient system over longer hikes. So, I will be making the change to a gas system next year. I’ll comment on what I am going to be using at some point in the future. Unlike our hiking cousins in the US, walking in the UK means that we are are in the company of a clean smelling general public on a more frequent basis. I don’t mind getting dirty, but I do like to try and get myself as clean as I can on a hike. 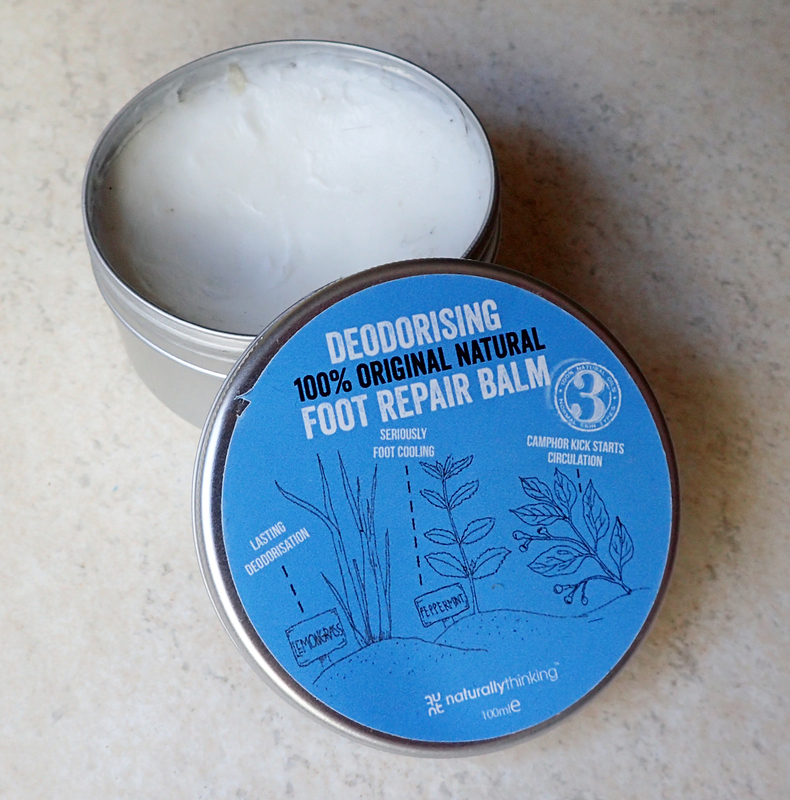 Teeth get brushed, hair gets combed and an attempt is made to clean as much of the days grime and sweat off, even if it is only the face, feet and pits that get the most attention. 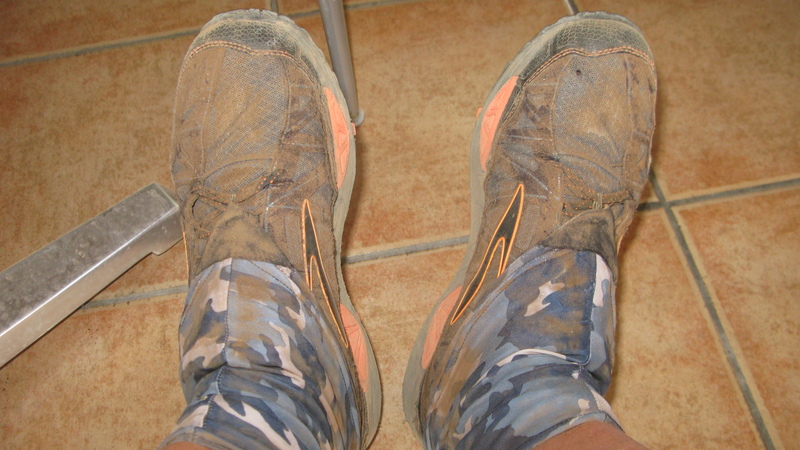 That said, I stank pretty badly at the end of my hike and it was mostly synthetic clothing to blame. I am pretty happy with what I took but the weight and, less importantly at present, the bulk, is still too great and I shall be further refining it. It is very, very easy to slip in too many ‘what if’ and luxury items, I think I need to do a fair amount of inward looking and remove a few of my many comfort items from my gear list. My Three Points of the Compass gear list is currently a work in progress but may be of interest nonetheless. 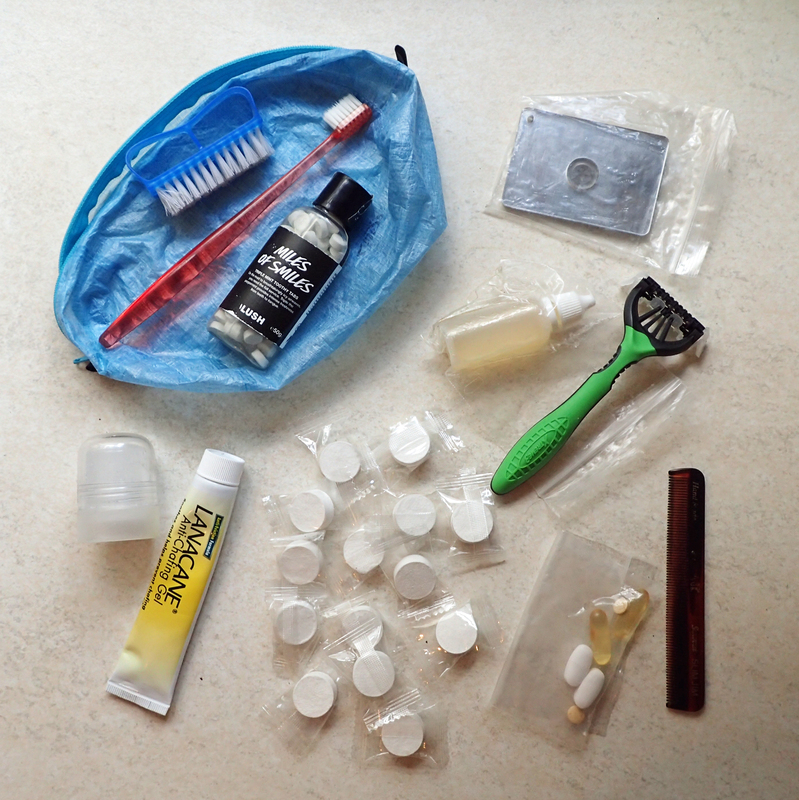 As I said at the head of this post, I am only reviewing here a handful of the items I took with me. Do ask if you have any questions. 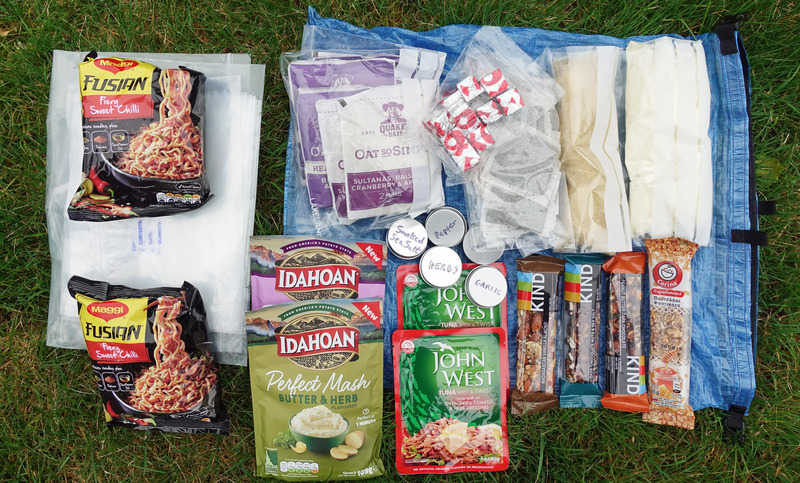 This entry was posted in Food, Gear and tagged gear, Hydration, hygiene, Icknield Way Trail, Knowledge, route, small stuff, stake, tent on November 26, 2017 by Jools.